Ran out of time to leave my report from today, but here are some pics I got. 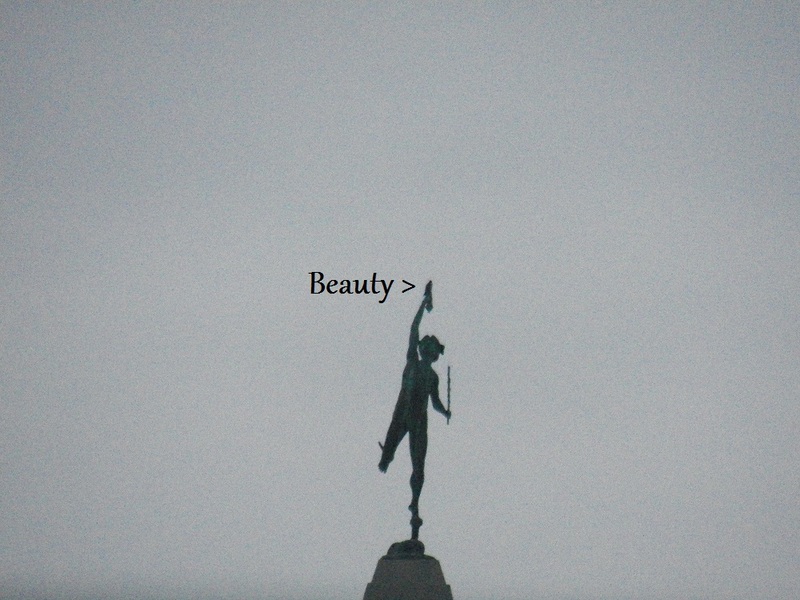 Saw Beauty and Pigott. 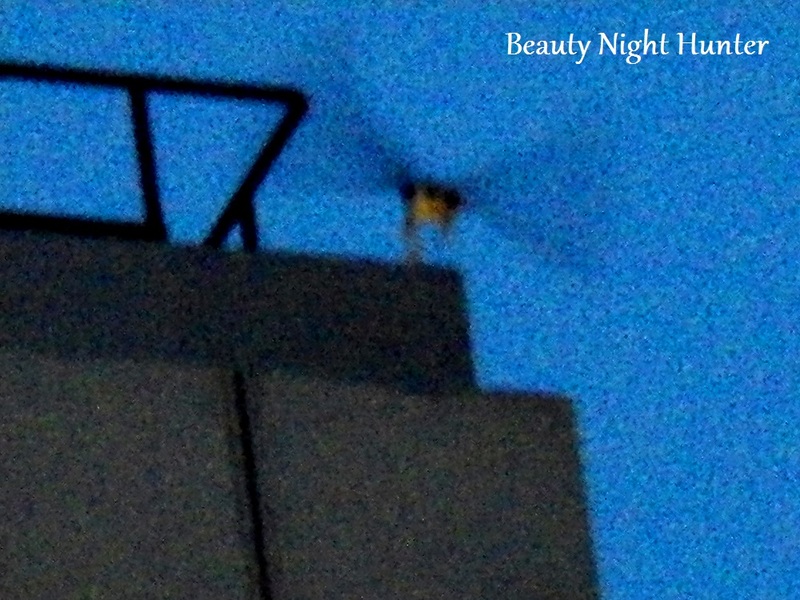 Even saw Beauty night hunting off of the HSBC building. Awesome! Beauty Night Hunting off HSBC Bldg. 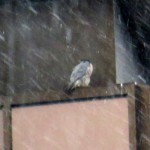 Today when I started my morning watch it was 32 degrees (F) 0 (C) with very light snow falling and no wind to speak of. Yesterdays slushfest is now only a memory! 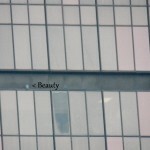 I was driving down Court St. by Xerox when I saw Beauty up on the southeast corner of HSBC. I turned down Chestnut St. to park in front of Manhattan Square Park but she took off as soon as I pulled over at 6:40am. 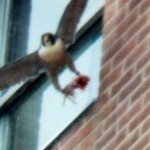 I watched her fly straight up Broad St. toward the Broad St. Bridge (BSB) so I followed. 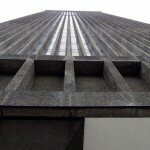 I didn’t find her with a trip around the city so I went to the Lake Tower (LT) apartments to check for a PEFA-nobody there. 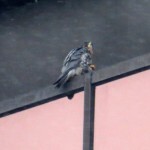 Returning to the BSB I found the Beautyful one on the top ibeam southeast side of OCSR-she was preening. 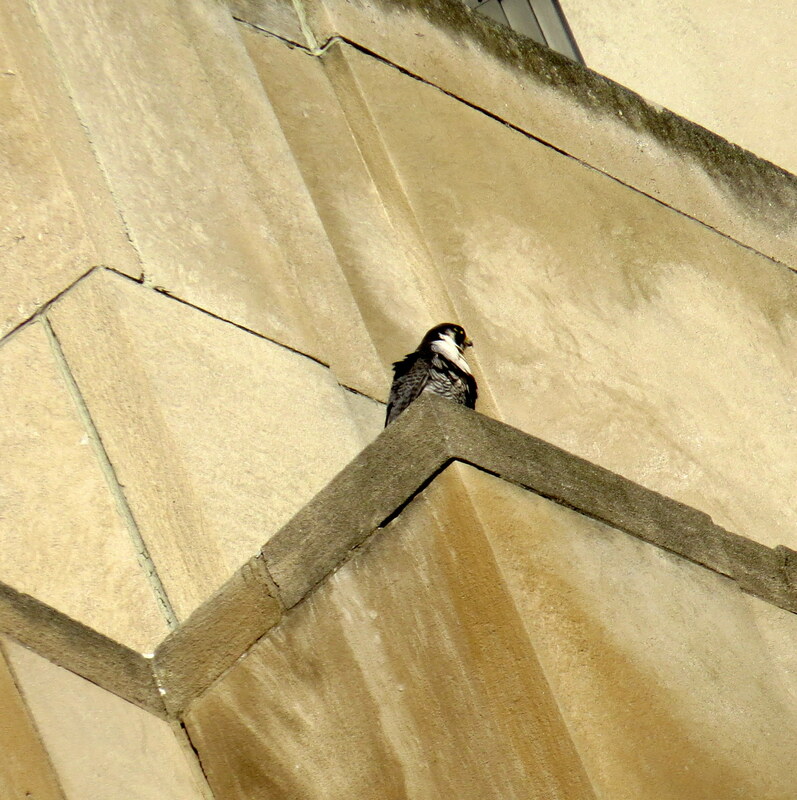 I watched Beauty preen,nap and watch the area for a potential meal. 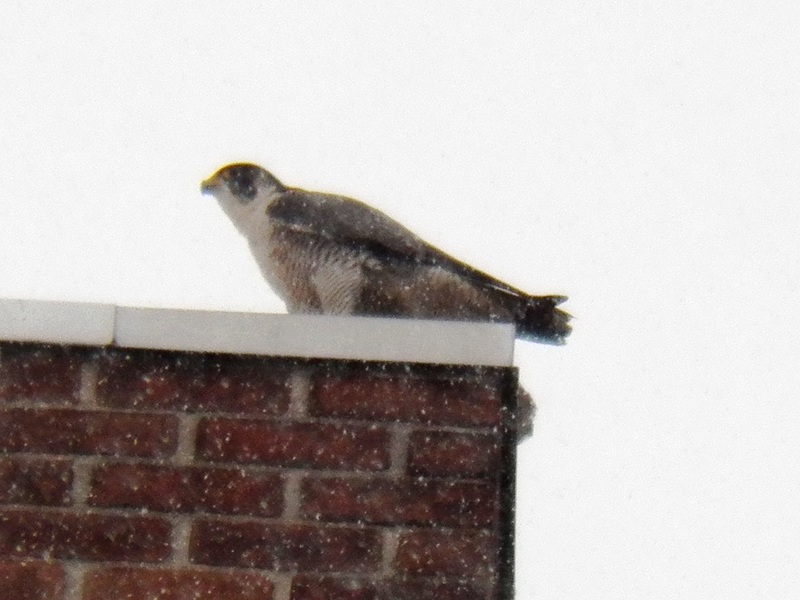 An hour and 15 minutes later she flew off to the west,went into a stoop after 2 pigeons. 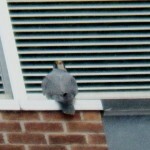 One of them veered off to the north with Beauty staying on the other ones tail. As they approached the Telesca building on the corner of Main and State. 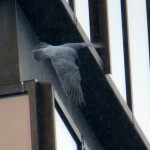 St. the pigeon put on a spectacular move and flew off free as Beauty gave up the chase flying north out of view behind the Crossroads building. 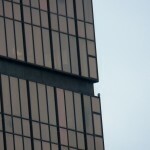 Again I followed behind and found Beauty on the west corner top ibeam of OCSR. 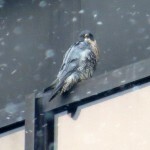 I parked across from the Rochester Plaza Hotel on State St. and observed Beauty for 20 minutes before she flew off. 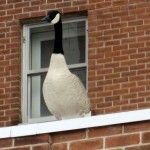 In the 15 minutes that I shared space with Miss Pigott there were 3 Canadian Geese honking away causing quite the racket. 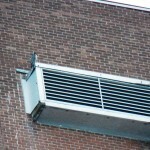 They nest on the roof of a lower building on the south side of the property which is below the vent Pigott was on. 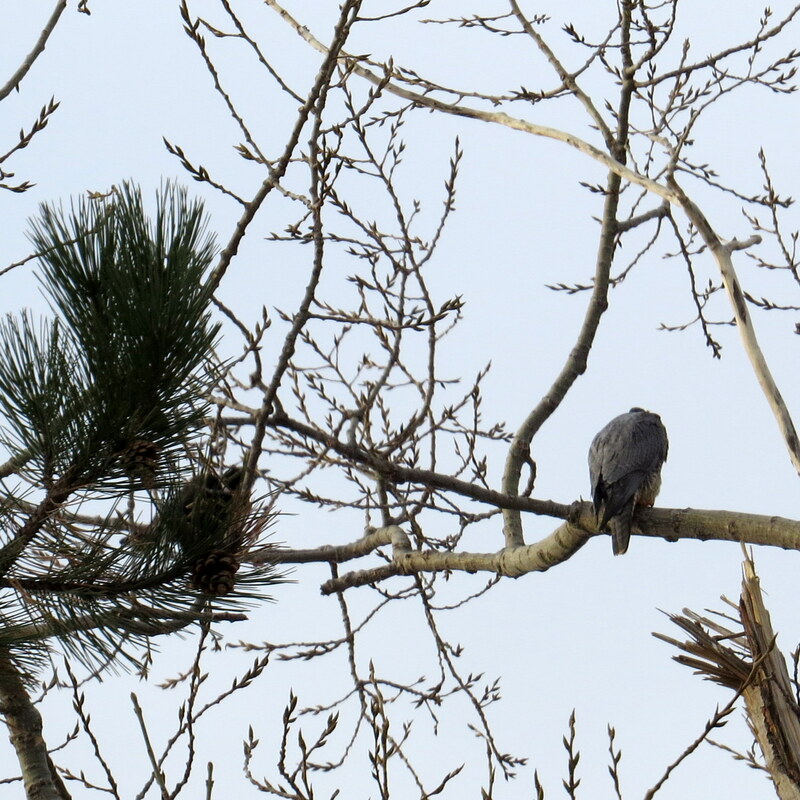 Pigott flew off to the east and didn’t return so I made my way to the back road out of the property where I spotted 2 crows dive-bombing a Red-tailed Hawk in the sky. 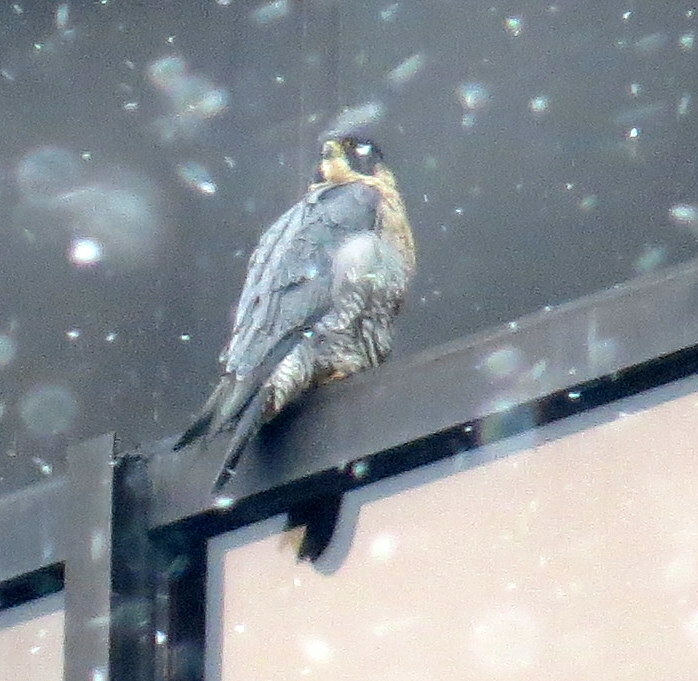 As I returned to downtown my search for Beauty was in vain so I went to LT and then the Kodak Park (KP) site-both were void of any falcons. 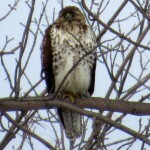 I spotted a Red-tailed Hawk in a tree at KP that was being harassed by a couple of crows. Boy oh boy crows are quite the bullys with raptors eh!? 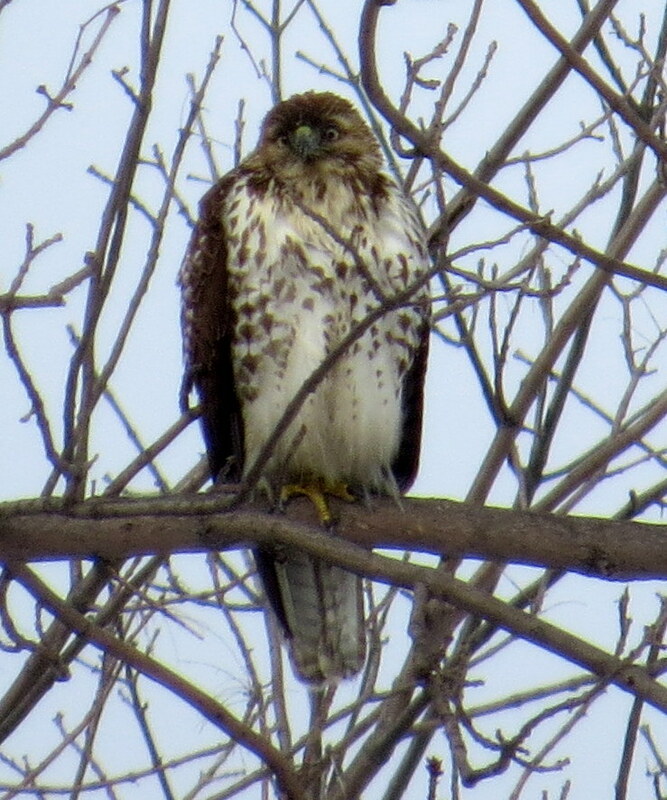 Red-tails are my favorite hawk and this one sent me on my way with a big smile on my face as I ended my watch at 10:30am! 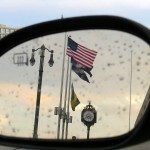 It was a mishmash of weather today. During the day, it constantly changed from sleet to snow to rain and back again. When I started my watch it was somewhere in between rain and snow. Thankfully the roads weren’t bad. 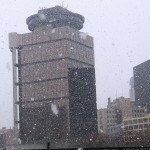 The city did a great job keeping up with the slippery wintery mix. 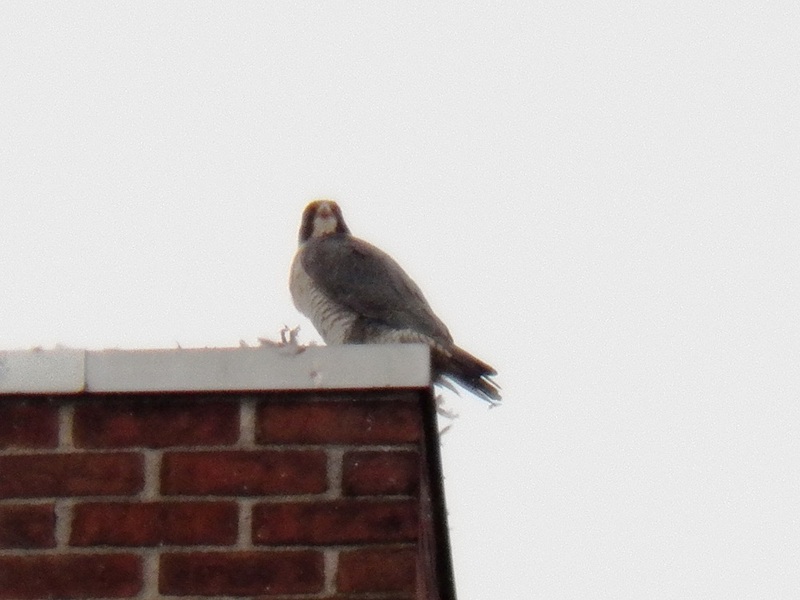 I first checked out the KP area, no falcons there. My next stop was the LT location. I checked both sides and found no falcons. 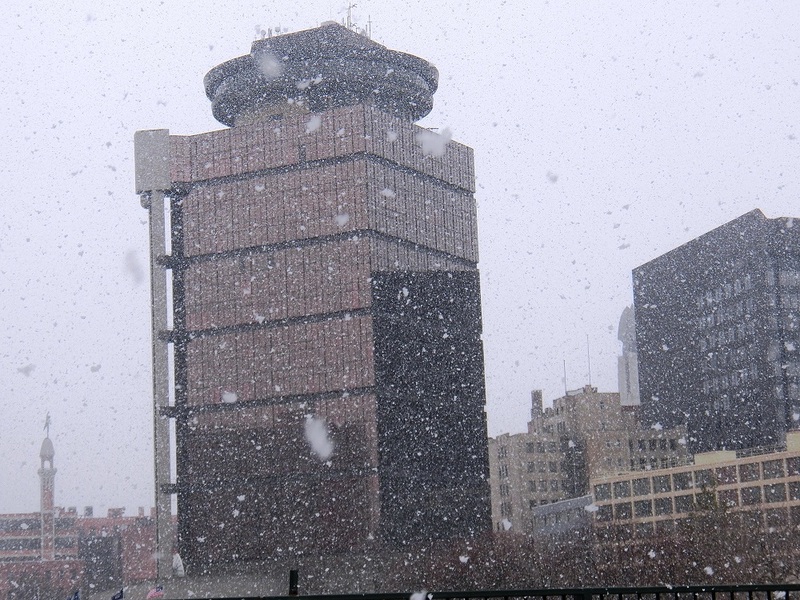 When I got downtown, it was more snow, so it was really hard to see. I checked the whole downtown area and couldn’t find any falcons. I ended up back on the Andrews St Bridge and looked back towards the Kodak Office Tower. 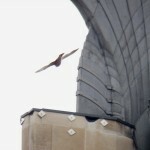 Was that a falcon on the arch ledge above the old Mariah and Kaver nest site? I drove over to get a closer look and found out that it was Beauty up there. 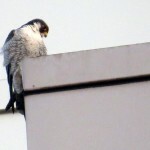 She was facing SE, keeping an eye on her territory. 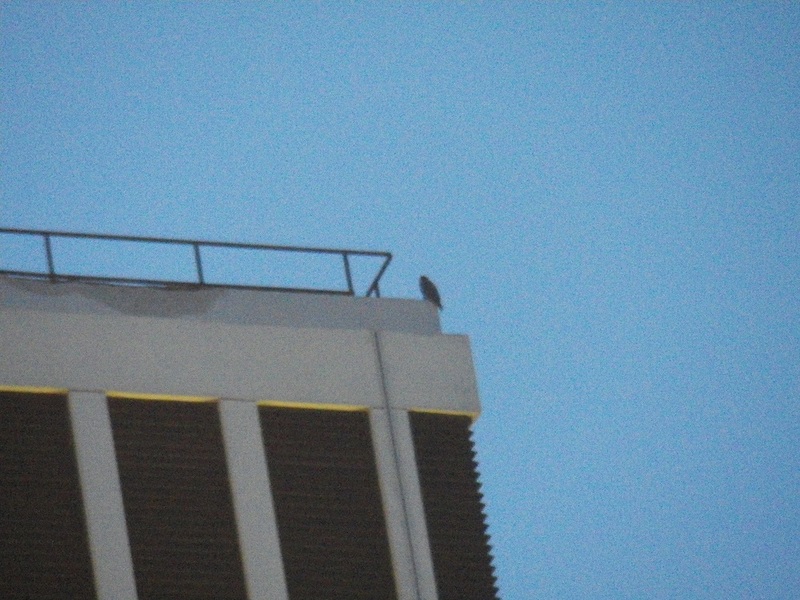 I circled the Kodak Tower checking to see if there might be a 2nd Peregrine up there, but there wasn’t. All was quiet and she seemed settled, so I headed over to check for Pigott at the BS location. 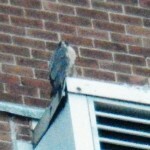 I quickly found her on the NW corner of the building, keeping watch over her territory. Two turns around the building and I was quite sure she was by herself. 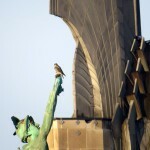 Like Beauty, Pigott seemed to just be biding her time waiting for the return of her mate or possibly another male. There is no certainty that things will remain the same. As we’ve all found out over the years, change is inevitable. That is just the way it is. 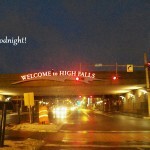 I left BS and returned downtown for one more look, then it was time to head home. 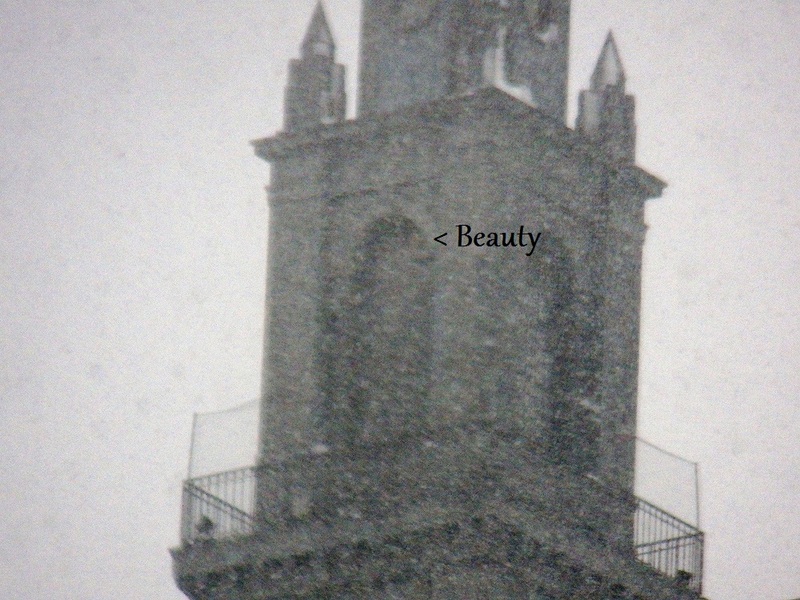 It was snowing even harder, and I could barely see Beauty on the arch ledge. 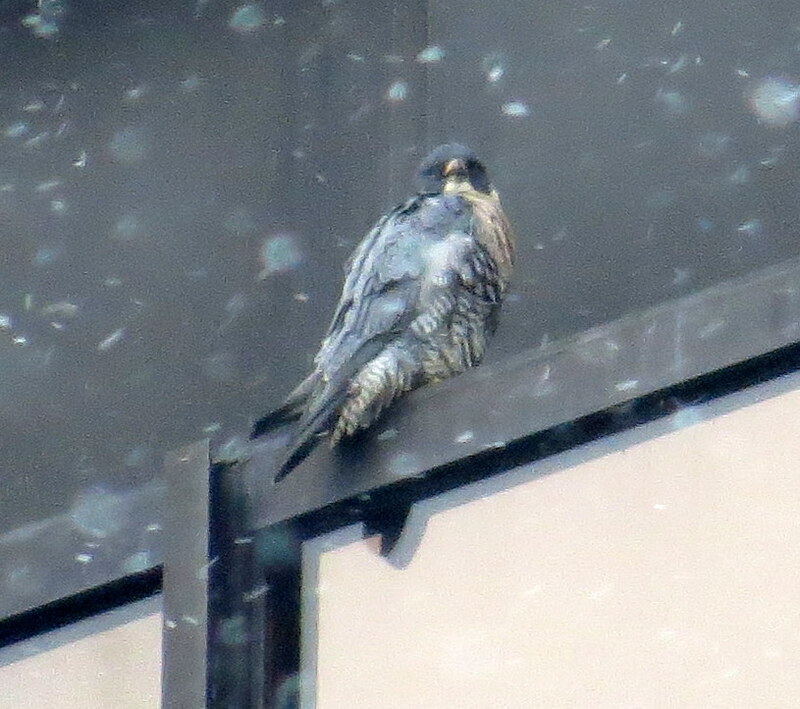 I watched her for a few moments and then headed over to the LT location for one more look. 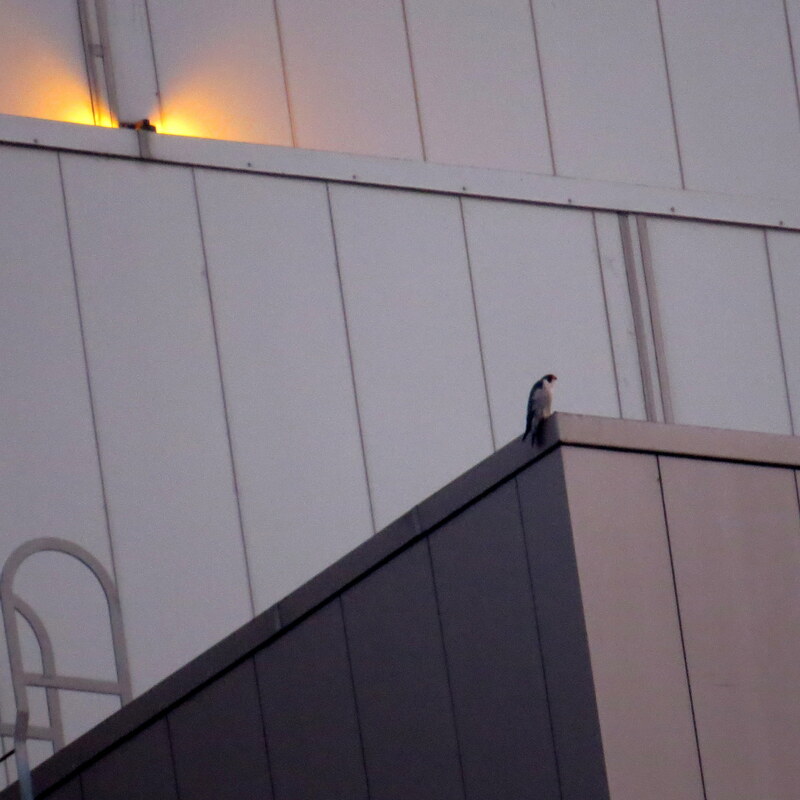 Again, I did not see a falcon there. Time to end my watch. 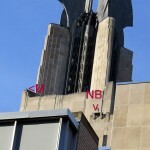 I’ll leave you with this picture of the Kodak Tower, showing some of the places labeled that we have been mentioning in our watch reports. 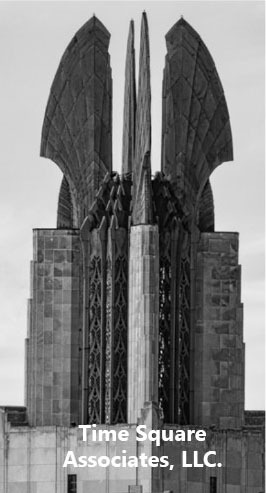 I know many of you are not familiar with this building. 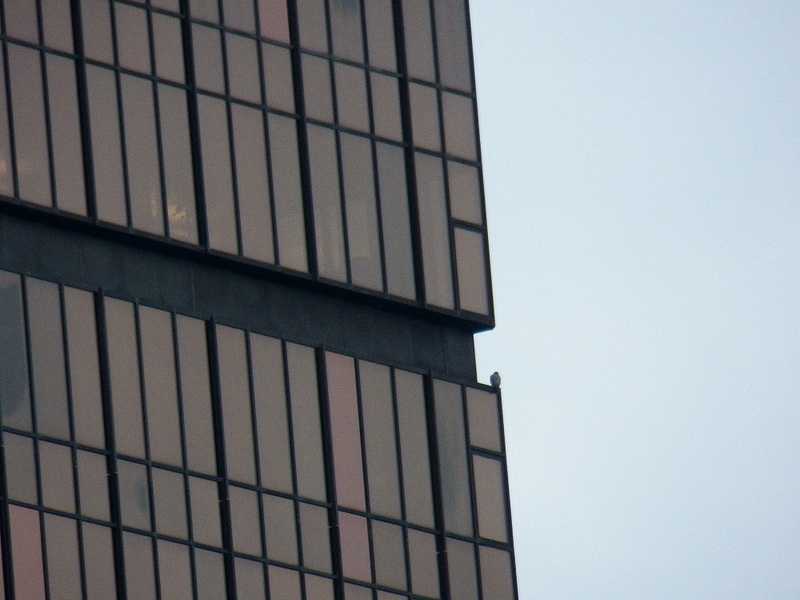 I spent years staring at this building when Mariah and Kaver were there. Hope it helps. 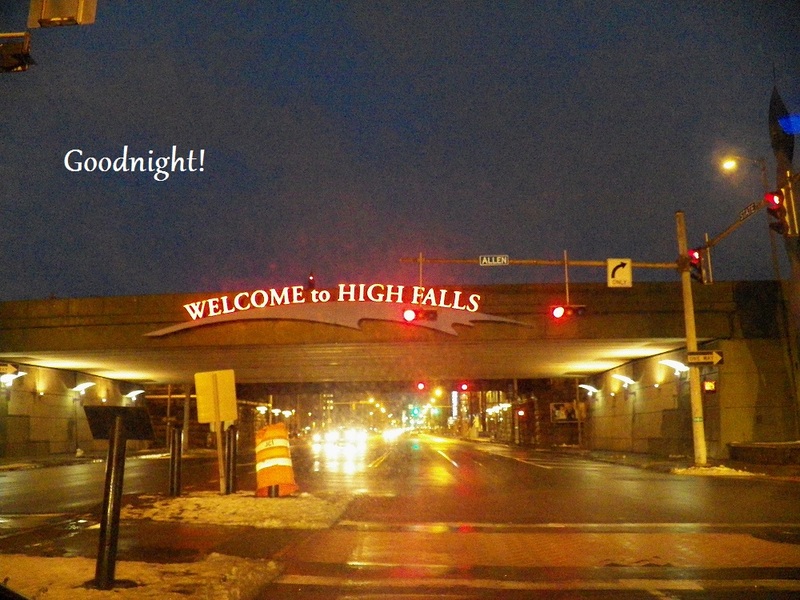 Be sure to click on any pictures you would like to see in a larger format. When I left the house there was a good 2 or 3 inches of wet slushy snow on the ground with more expected. At 34 degrees (F) 1 (C) it was going to stay sloppy. 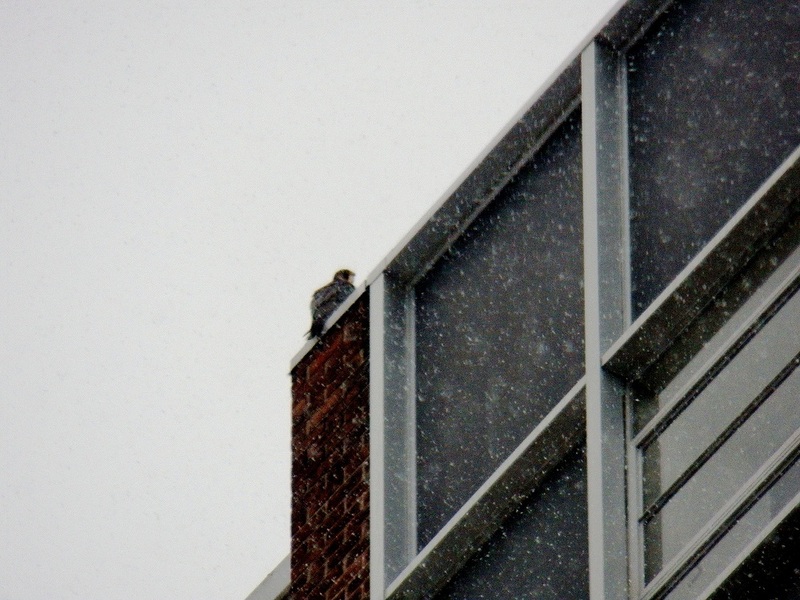 During my watch it snowed and sleeted in varying intensity. Starting out on the Broad St. bridge I could see no Beauty and no mystery tiercel on any of the buildings visible from there. 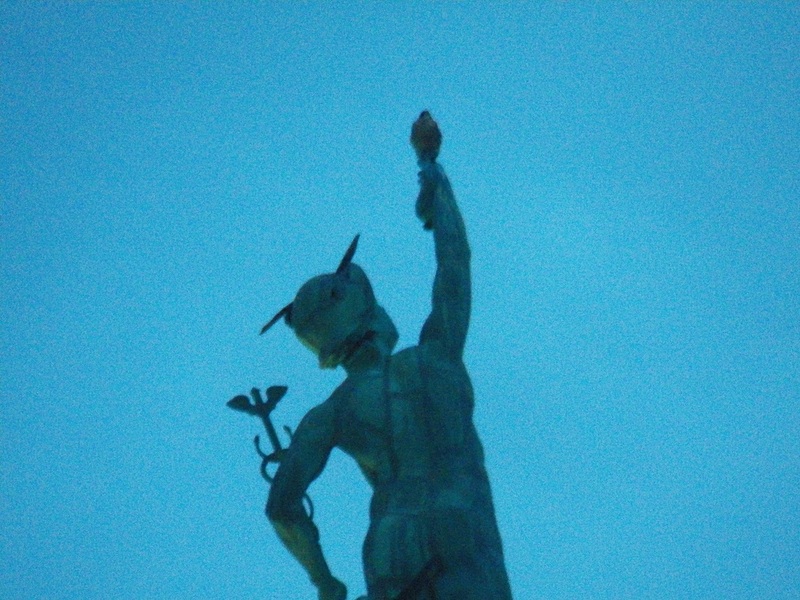 The Mercury statue had snow stuck on its back side. 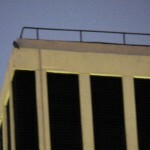 I drove around looking and ended up checking the Lake Tower apartments for our other mystery PEFA with no luck. 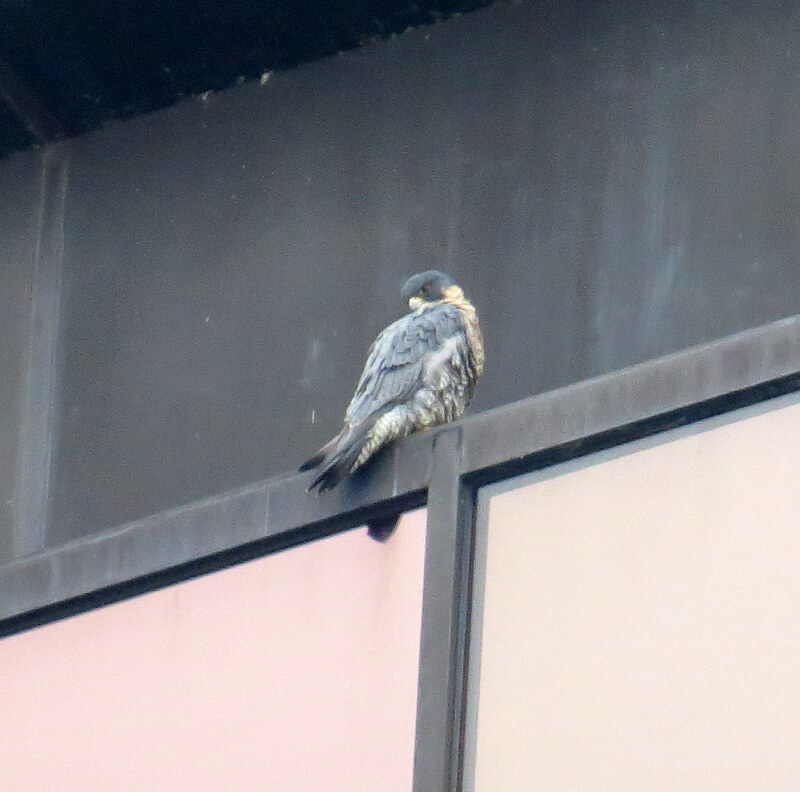 When I returned to the downtown area I found Beauty at 7:05am on the west corner top ibeam of OCSR a spot she has been frequenting lately. I started out on Aqueduct St. a place I lovingly call the hole because you’re surrounded by buildings and it feels like you’re in a hole. 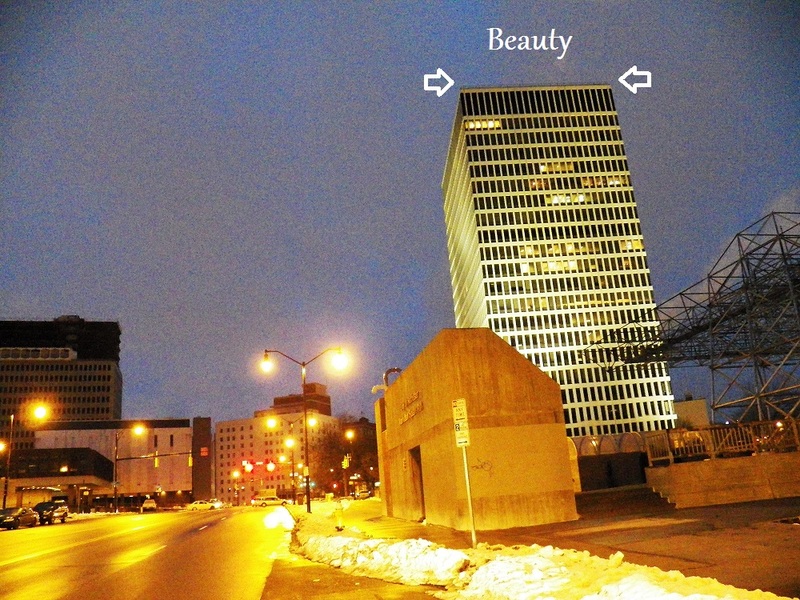 I then drove over to State St. and parked across from the Rochester Plaza Hotel to share space with the Beautyful one. 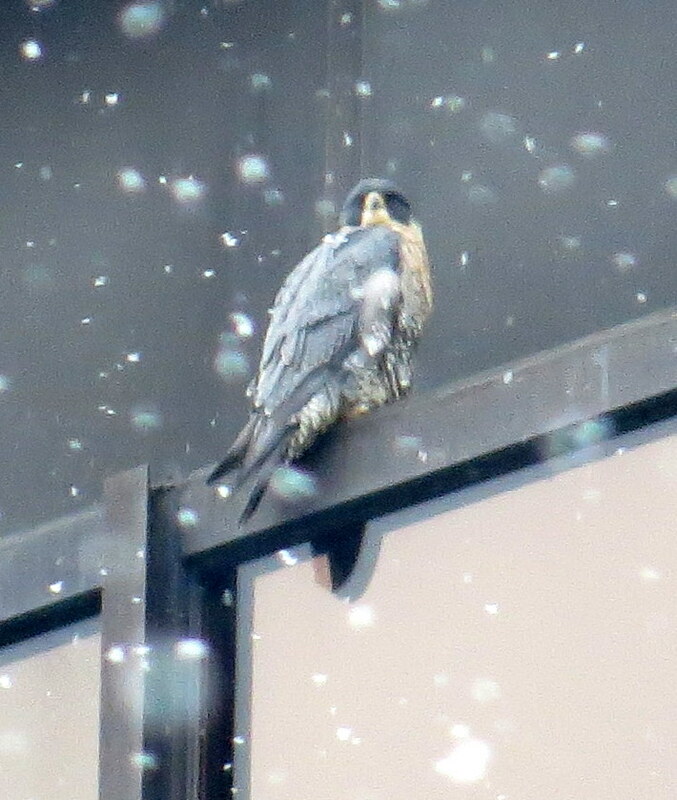 Just like yesterday Beauty moved around the corner to the north side probably to avoid the heavy sleet that was pelting her. I stayed with her until a little after 8:00am took a spin around downtown to look for mystery man and ended up at the Brighton site. 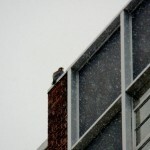 It was half snowing and half sleeting when I arrived with Pigott on the west end of the south side vent. 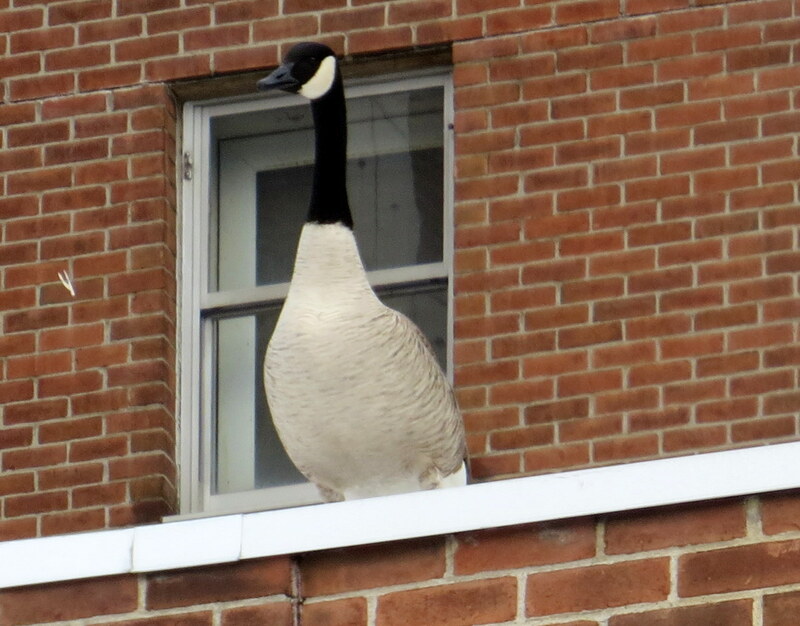 Pigott was watching a Canadian goose that was on a lower roof below her and generally keeping an eye on the trees for a meal. 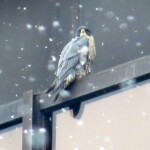 She did do a little preening but let’s face it with wet snow and sleet coming down so hard it wasn’t improving her looks ! lol She also napped briefly making me think of her sleeping prince BST. I miss the little cutie and hope he is safe! I left Miss Pigott after an hour or so to see if Beauty was still on OCSR or perhaps the tiercel from yesterday was around. No luck on either falcon so I ended my watch at 9:44am. 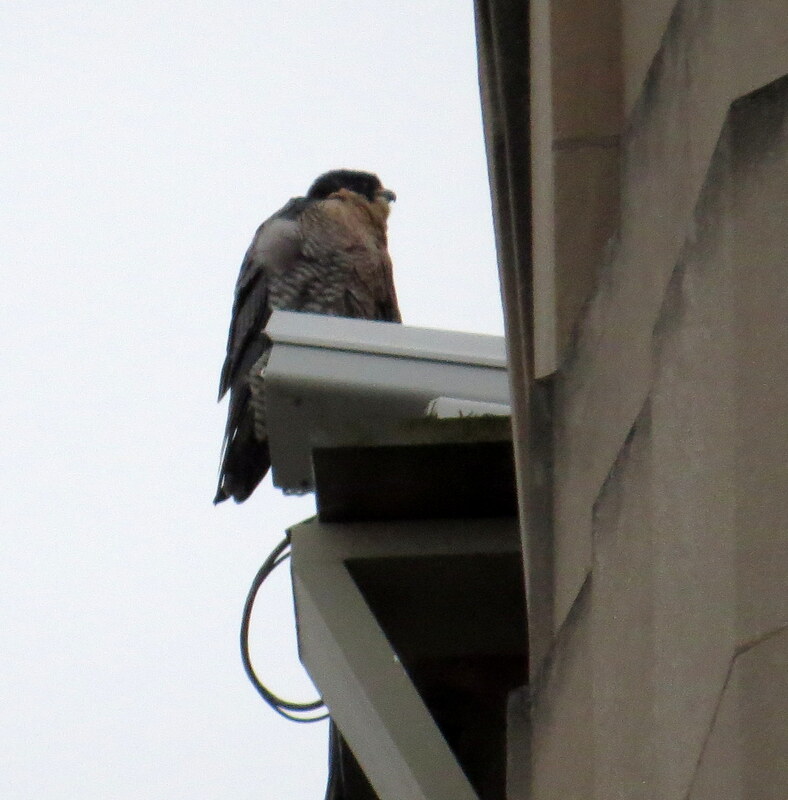 I’m thinking M (mystery tiercel) stopped in Rochester to get some rest before continuing his migration and has moved on now. It was fun following him around-made me smile! 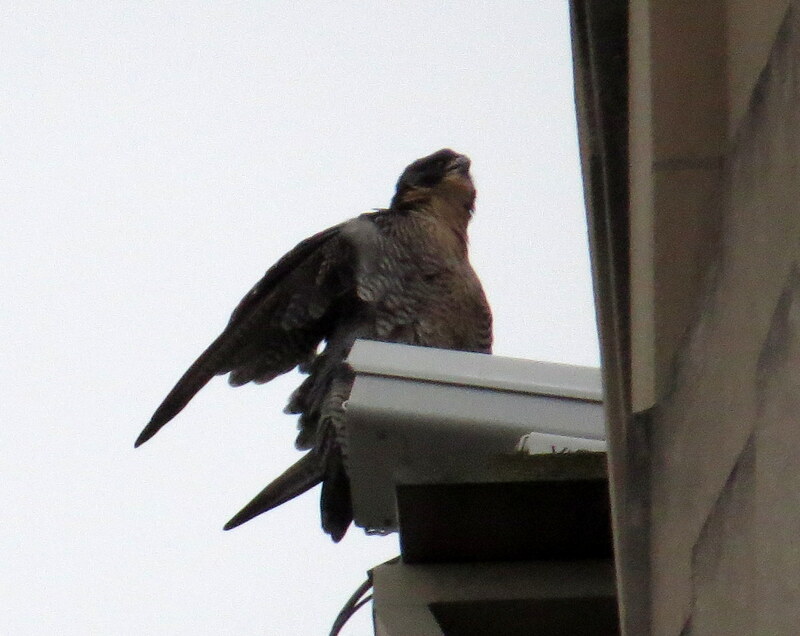 After a very long day at work, I was ready to head downtown to watch Beauty and the new, unbanded tiercel I had seen flying so gracefully for her yesterday. Sadly, I had no sightings of the tiercel during my little over two hour watch. 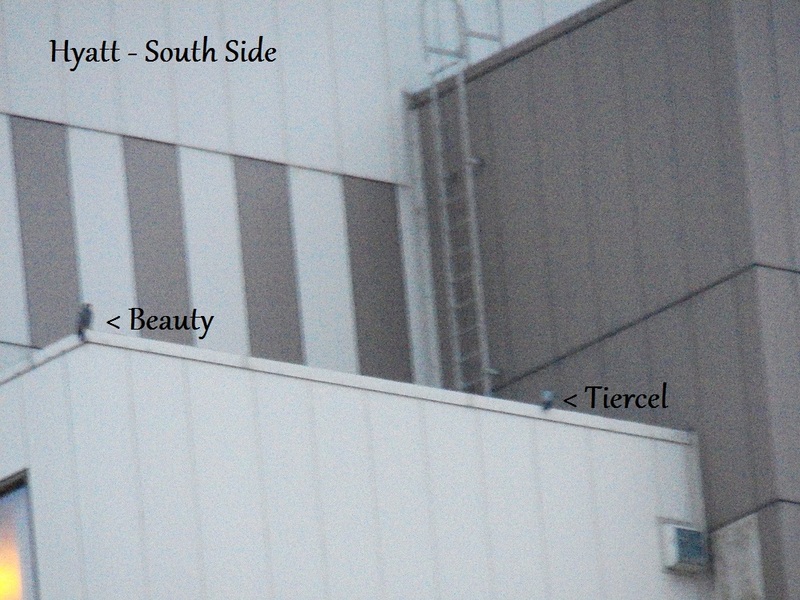 But, Beauty was there, spending most of her time on the OCSR, top IBeam on the NW side. 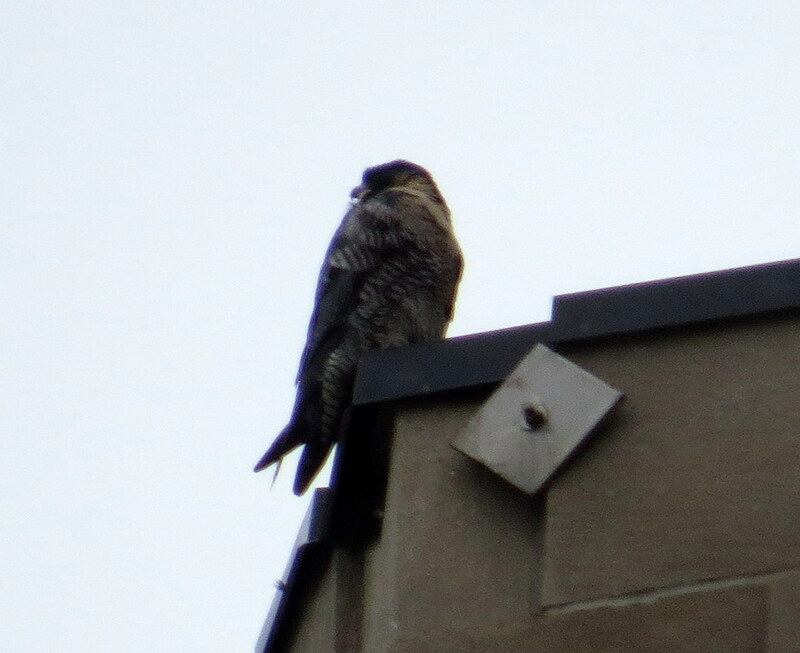 She moved from the west end corner to a foot or so in on the NW side. 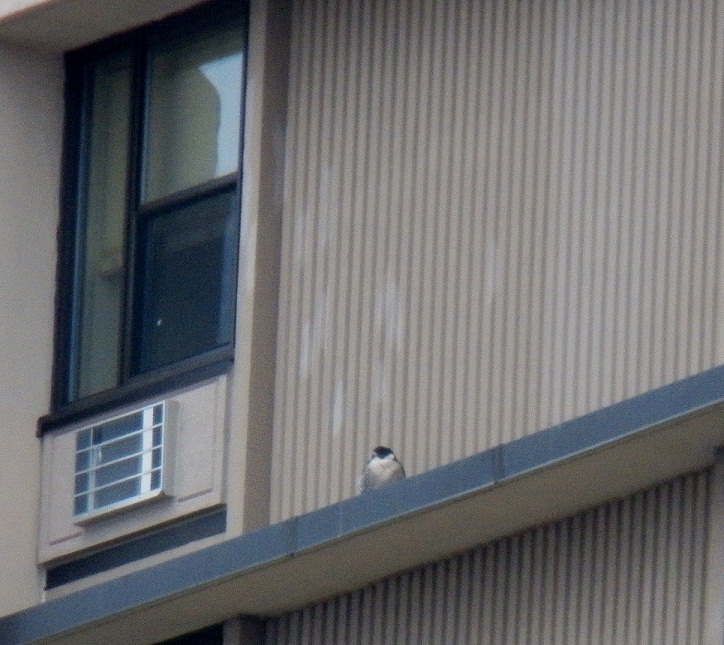 She preened a bit, but the majority of her time was spent looking intently to the northwest. When I first arrived on the Broad St Bridge at about 3:45 pm, I found Joyce and Steve (with Casey and Abby) parked near the east end. Brian was with them. He had been out much of the afternoon watching the falcons and they were going to take him home. We chatted for awhile before they had to leave. 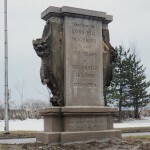 Joyce said that she and Steve would stop at the Brighton site on their way home to check on Pigott. 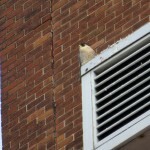 They tweeted at 4:34 pm that they saw Pigott fly from the BS bldg. to a nearby cell tower. I was happy to hear that she was seen today. 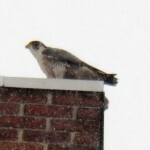 Since Brian does not leave Falcon Watch reports, here are his tweets from this afternoon. 1:19 pm - PEFA flying around Xerox. 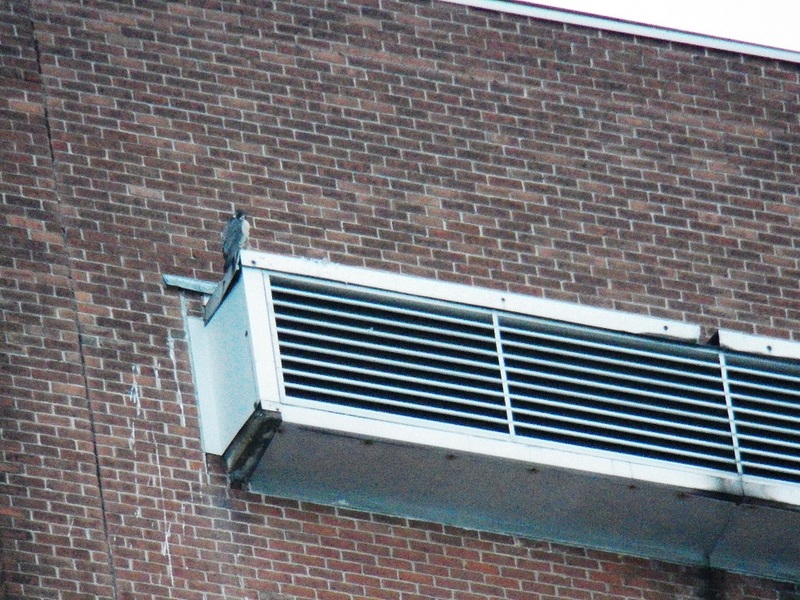 1:44 pm - 2 Falcons same size, squared off over Xerox. Gone now. 2:34 pm - I’m on the garage. 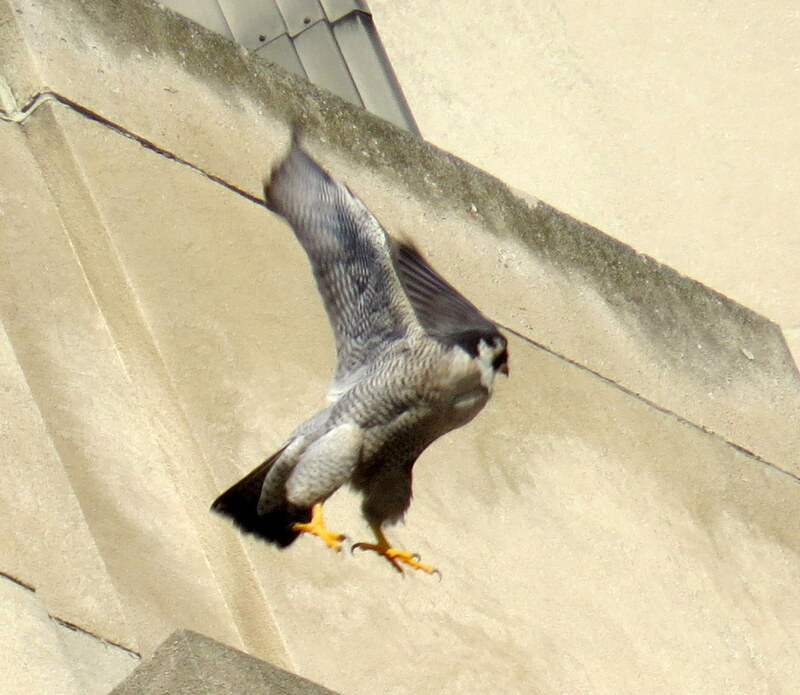 B and Tiercel flying around. I think they’re on Xerox. 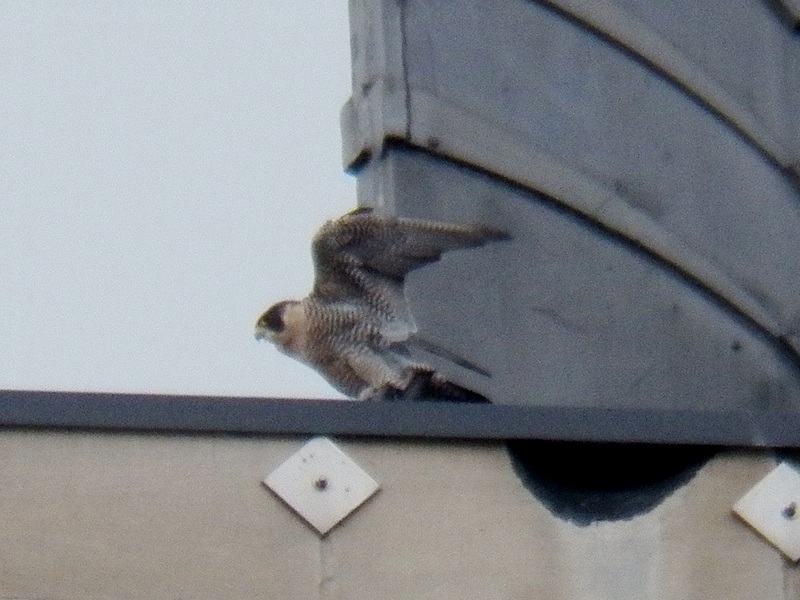 2:43 pm - I think B on OCSR and Tiercel on Xerox. 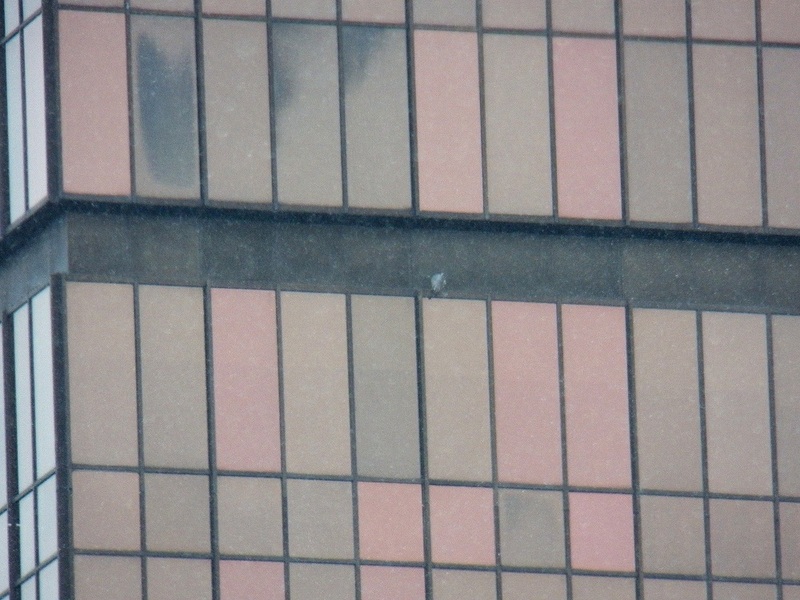 3:25 pm - Think its B on NW corner OCSR. I’m on bench at BSB. Beauty was still at the same spot when I arrived. 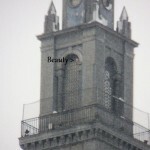 I watched from the Andrews St Bridge, where I had the best view of Beauty. 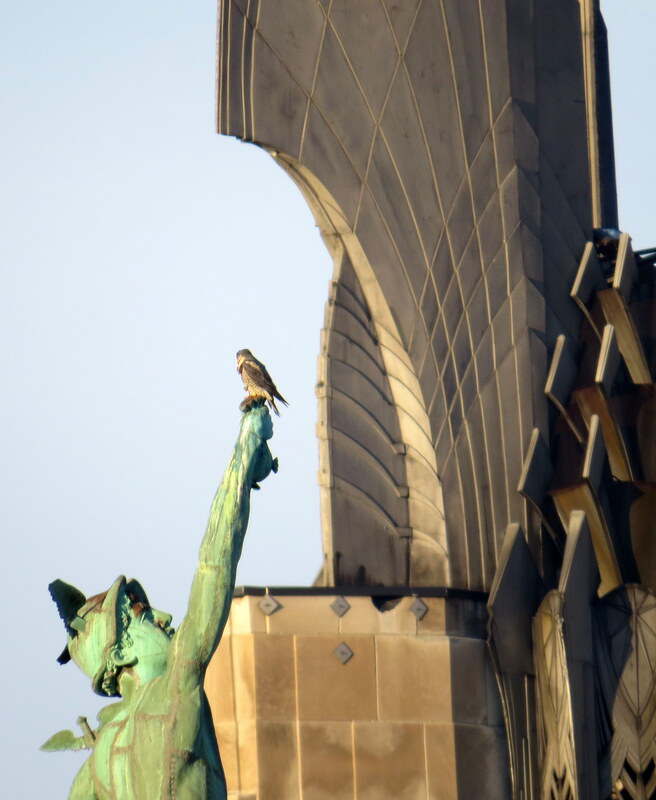 She remained there until close to 6 pm, when she finally took off and flew down to land on the Mercury statue. 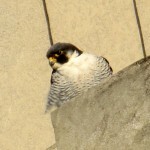 I drove over to the Broad St Bridge to take a couple pics and to check out the area to see if the tiercel had returned. I looked all over for him, but could not find him. 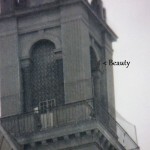 By the time I looked back at Beauty, she was gone. 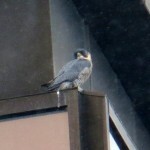 I drove all over downtown, but had no luck finding Beauty or any other falcons. It was dark by this time and it was time for me to head home. Looks like the weather in Rochester (NY) is going to get nasty tonight. Rain, changing to sleet and wet snow overnight, with more snow tomorrow. High 37 degrees (F) tomorrow. 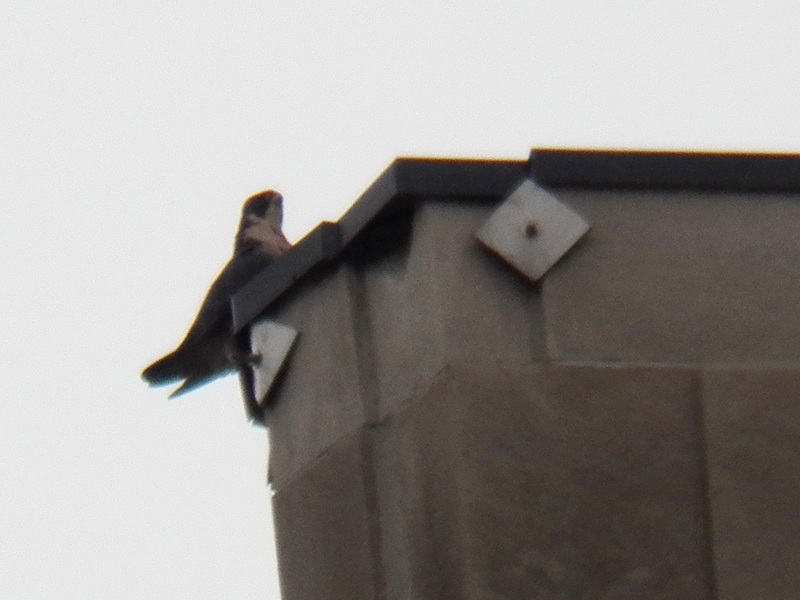 Finally, I’d like to add that I do not believe that this unbanded tiercel is BST, the tiercel that spent so much time with Pigott at the BS location. This is of course, is just my opinion. It was forecast to be sunny this morning with clouds and snow coming in the afternoon. The temperature when I left for my watch at 6:15am was 26 (F) -3 (C). 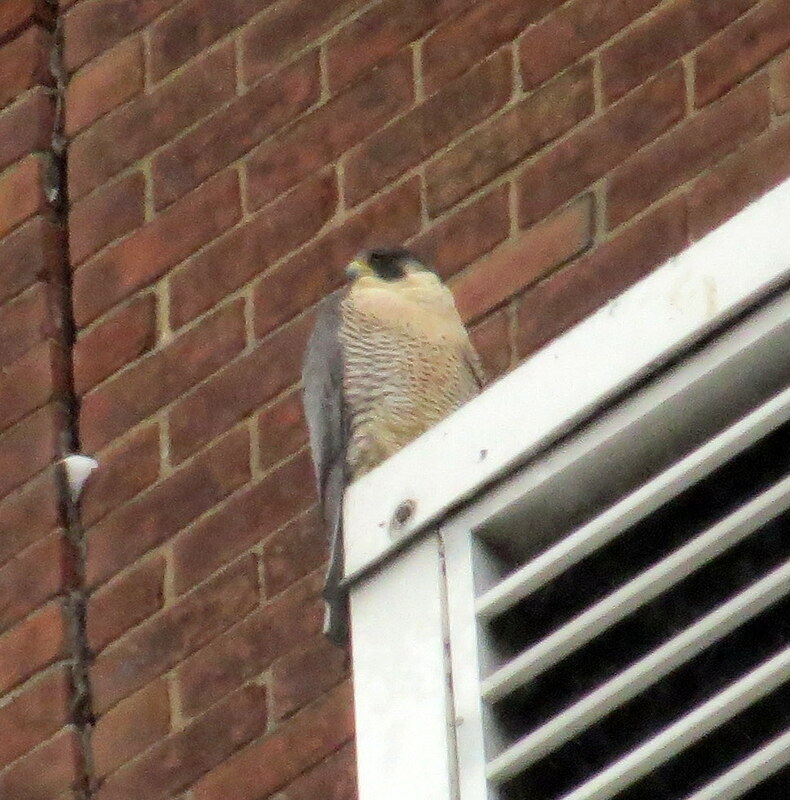 I went straight away to the Broad St. Bridge (BSB) to check the Hyatt Hotel for that’s where the new mystery tiercel(male) Peregrine Falcon was last seen. 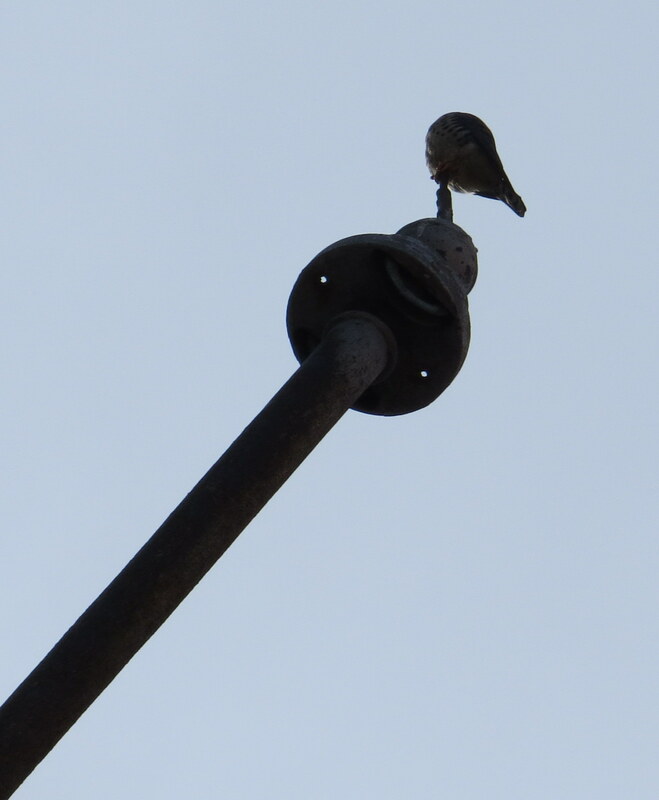 I have named him M as in Mystery for ease of tweeting and IDing. 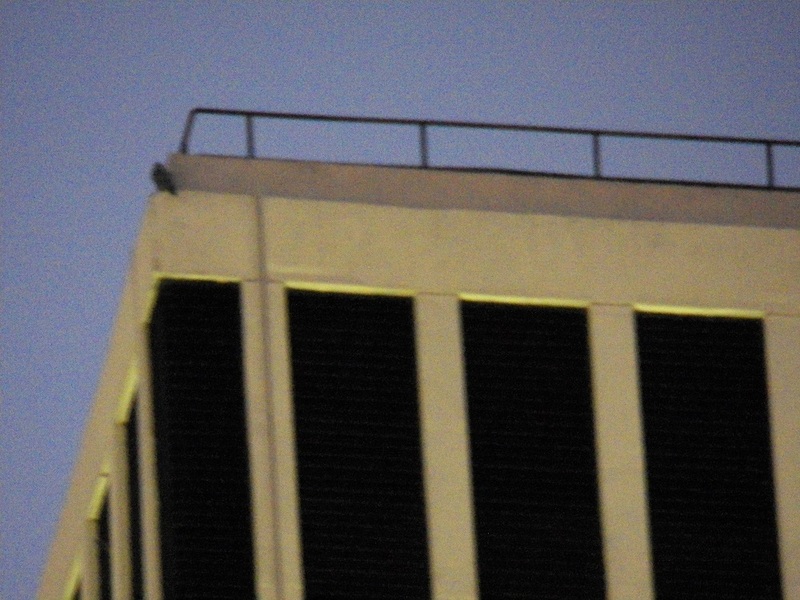 M was still on the Hyatt on a lower roof south corner. 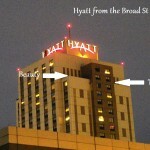 I left the bridge to go up to the top level of the South Ave. garage for closer viewing since it’s connected to the Hyatt. 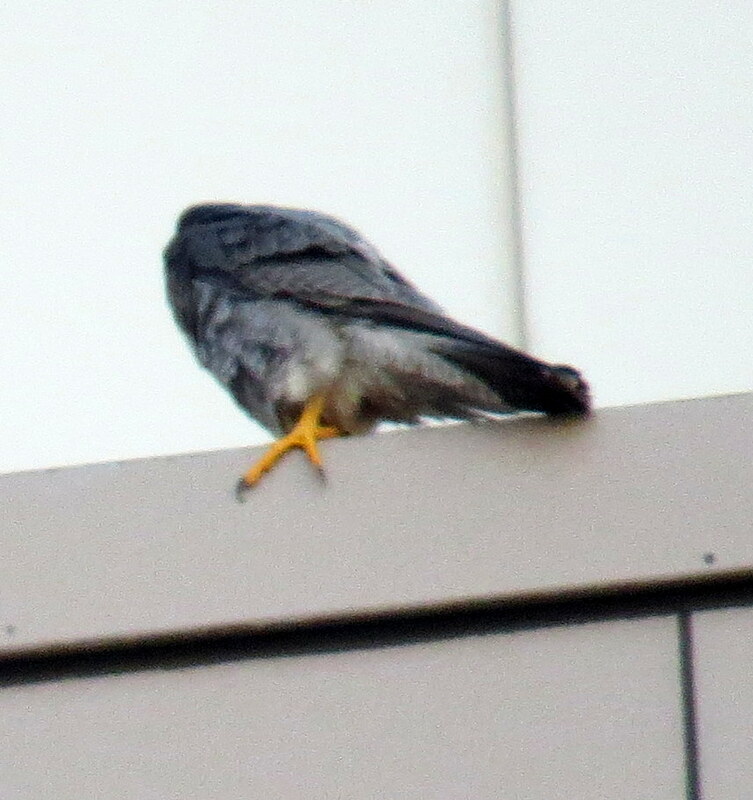 I was able to get many pics of M and some leg shots that showed he was wearing no leg bands. 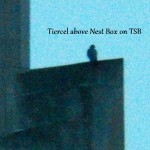 M stayed up there for an hour before flying toward the Times Square Building (TSB). 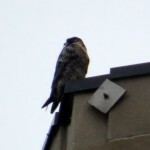 At 7:40am I could see Beauty at the nest box and M circling above the TSB. 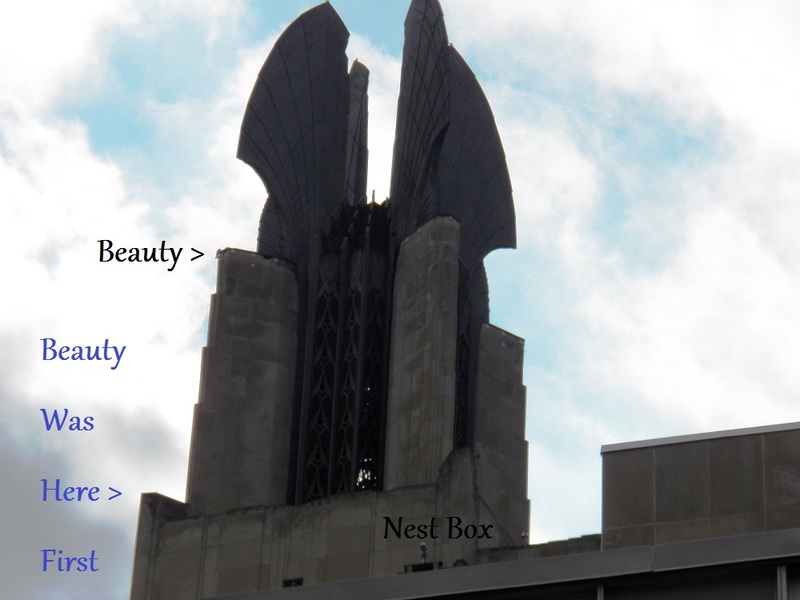 Beauty left the nest box to fly with M briefly and then he flew behind TSB and came around the south side landing somewhere. From my vantage point I couldn’t see where exactly and neither could Beauty for she flew to Mercury and was looking for him. I decided it was time to get down off the garage at this time and while I was in transit Beauty left Mercury but as I parked in front of the Blue Cross Arena on Exchange St. 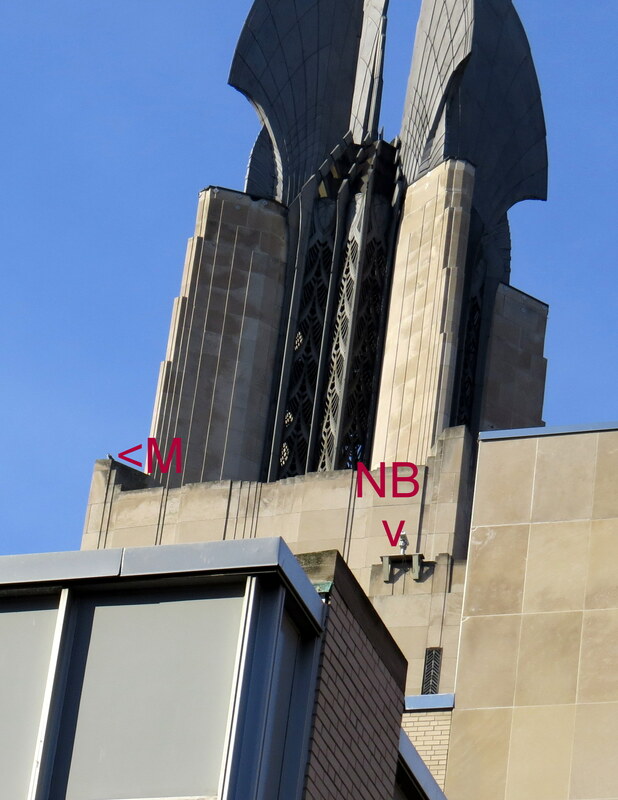 I had a clear view of M on a south side column of TSB. There was no aggression shown between Beauty and M at any time during my watch. 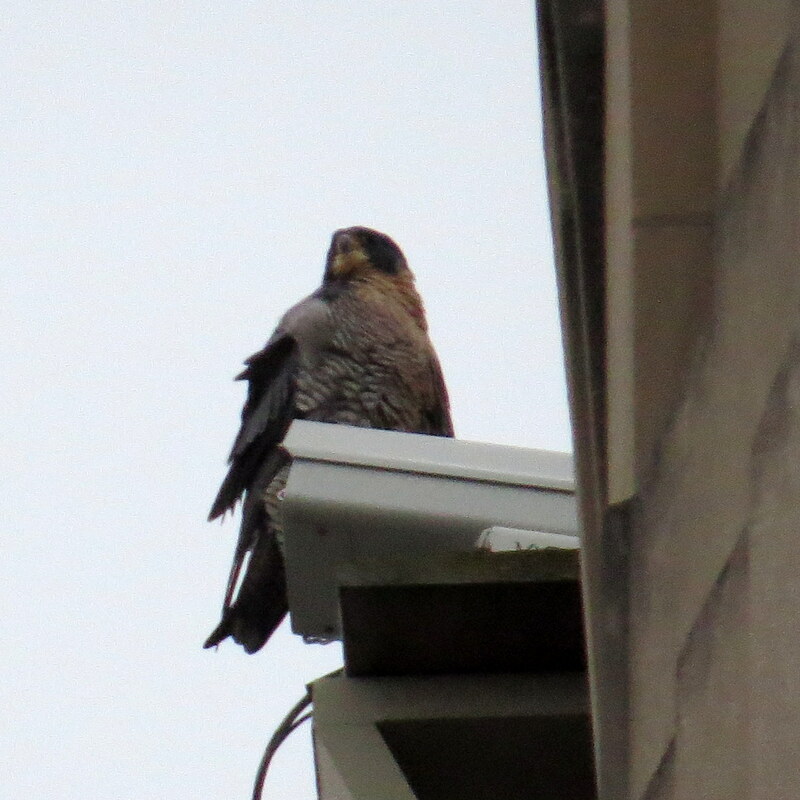 Beauty came flying in above M checking him out and then she disappeared for half hour. 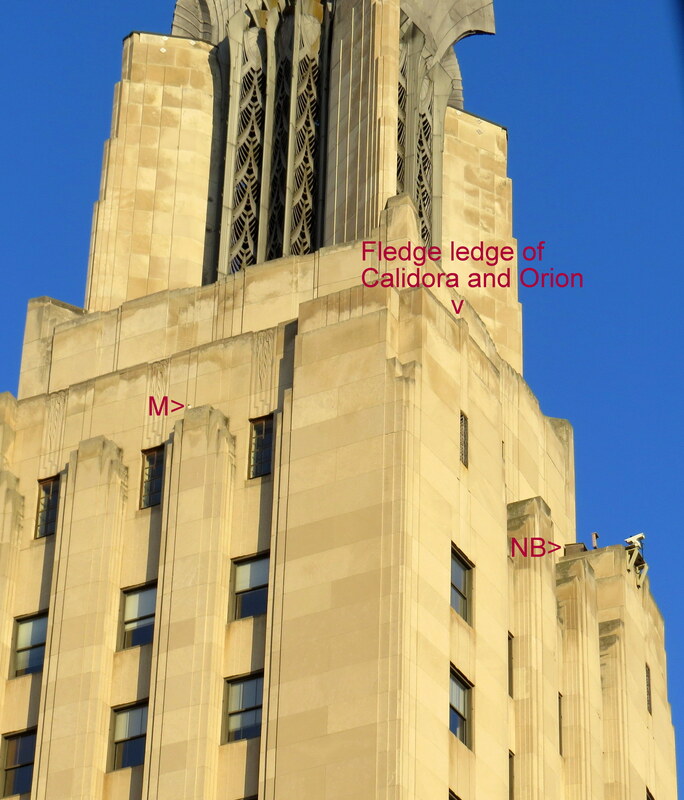 At 8:44am M flew off and met Beauty for a brief fly together near the Wilder building and then Beauty flew to the nest box with M going to the ledge on the south side of TSB across from the nest box where Calidora in 2010 and Orion last year fledged to. 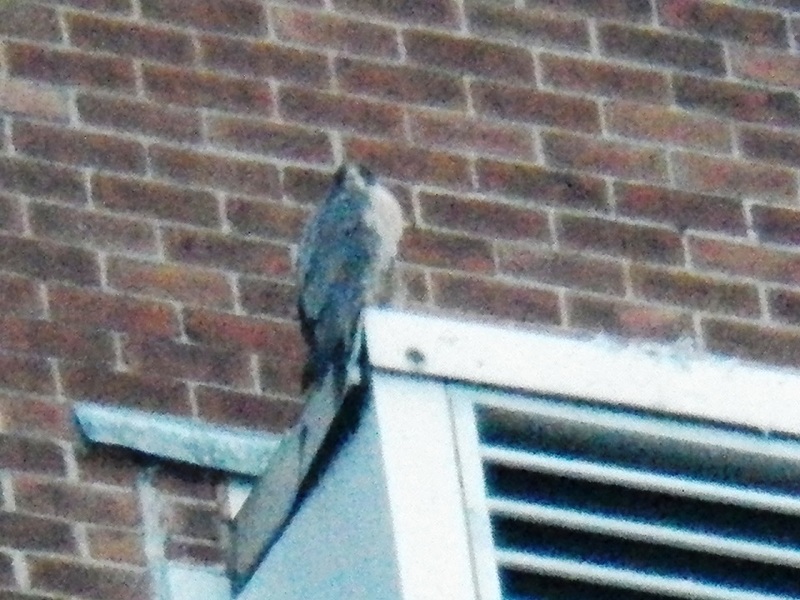 Then they both flew off going behind the TSB where I lost them. 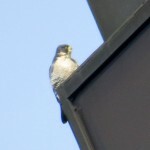 At 9:24am M went to the south column opposite nest box one level up and Beauty to the west corner top ibeam of OCSR. 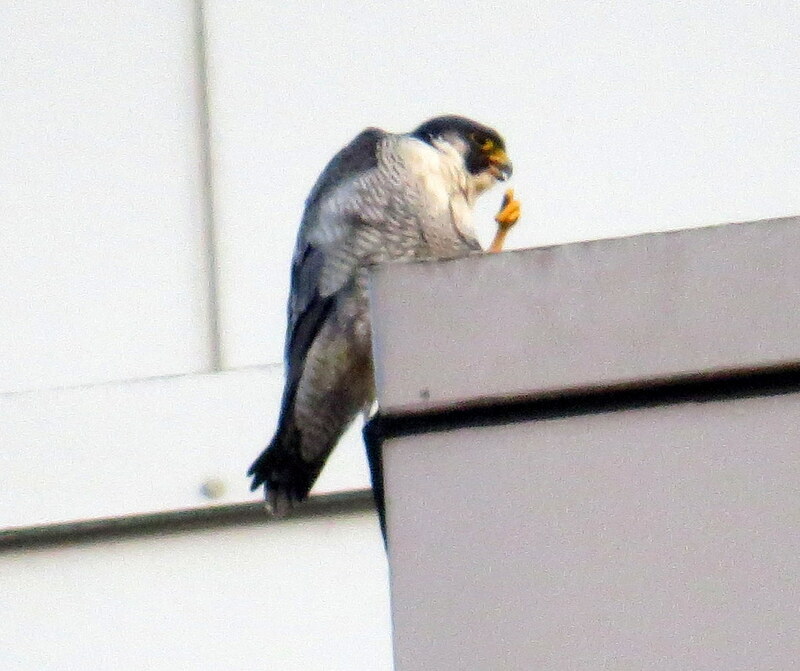 A few minutes later M flew over near Beauty on OCSR and did a little display flying for her. 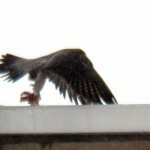 She flew off with him going behind OCSR and she returned to her west corner top ibeam of OCSR as M never returned and that was the last time I saw him on my watch. 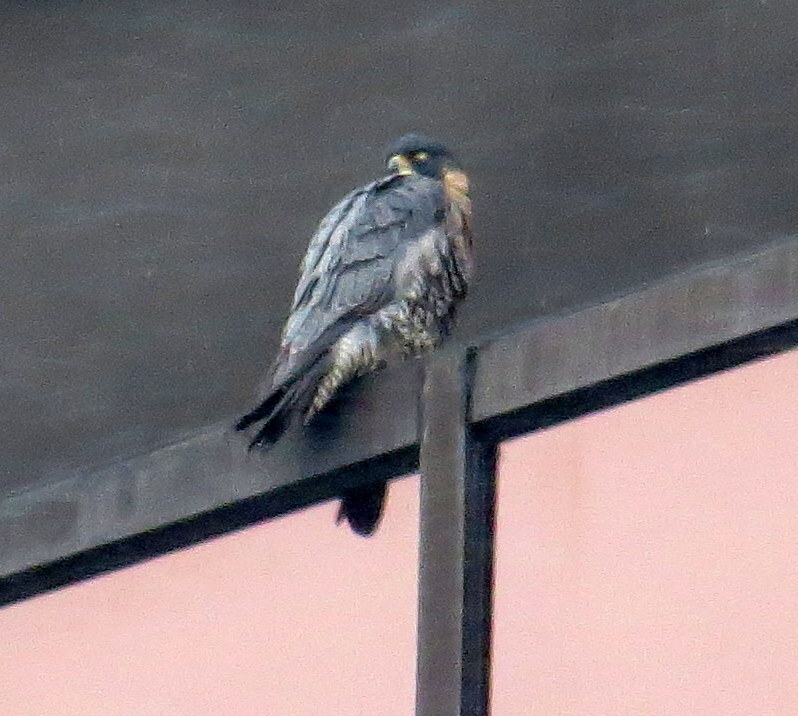 She flew off a few minutes after that and then I couldn’t find her either so I took a ride to the Lake Tower and Brighton sites to check but I could find no PEFAs at either location. 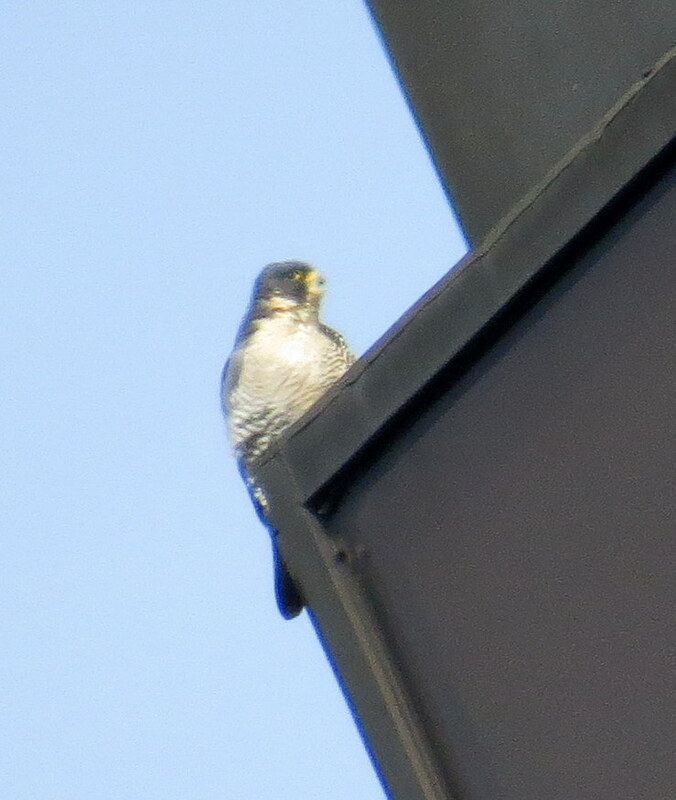 I then returned to downtown and parked on the BSB where I spotted the Beautyful one back on the OCSR west corner top ibeam at 11:00am. 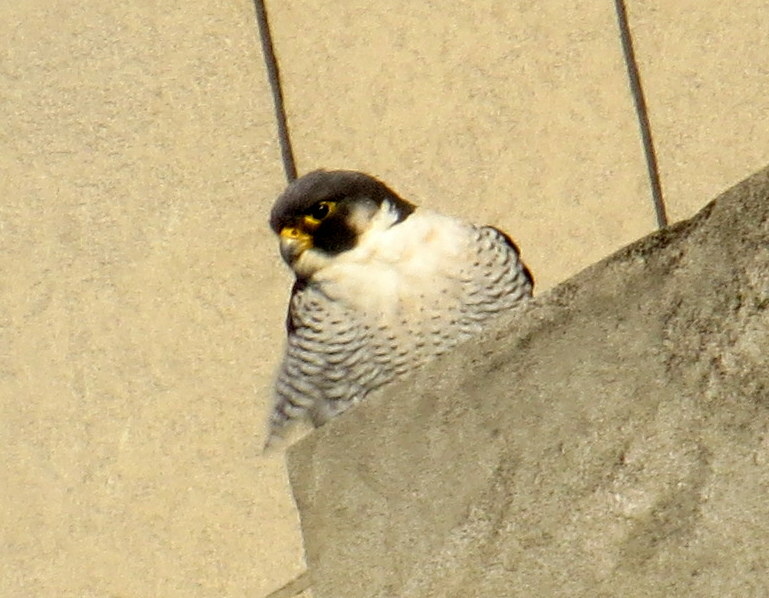 She was in the bright sunshine as she stayed there for the next 30 minutes. 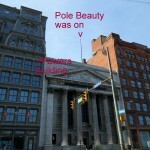 At first I thought Beauty had flown north but Donna let me know she had just gone around the corner as I parked on State St. across from the Rochester Plaza Hotel to observe. 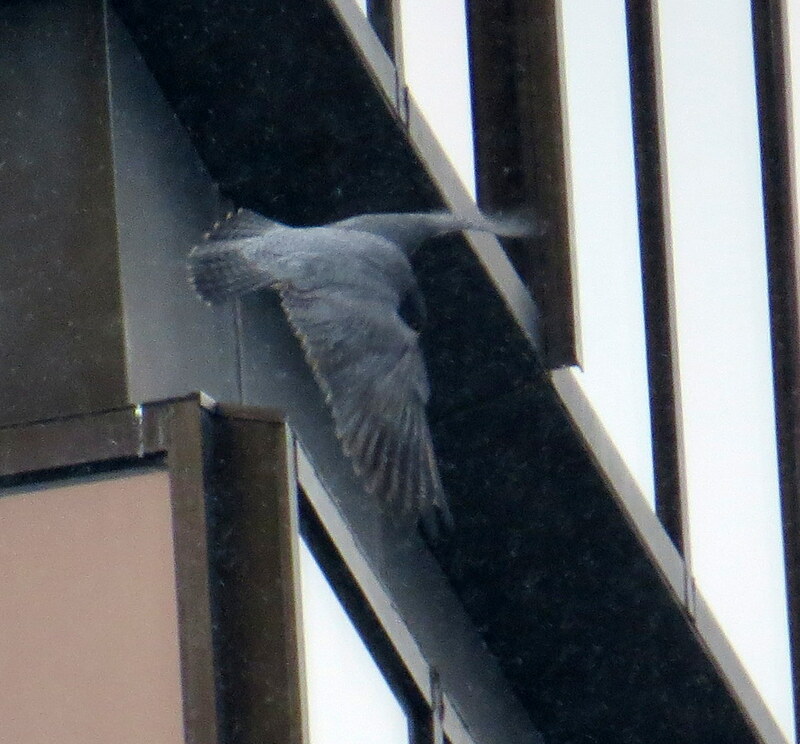 At 11:41am Beauty flew off OCSR and came straight across between the Crossroads building and the hotel to land on a pole directly above me. 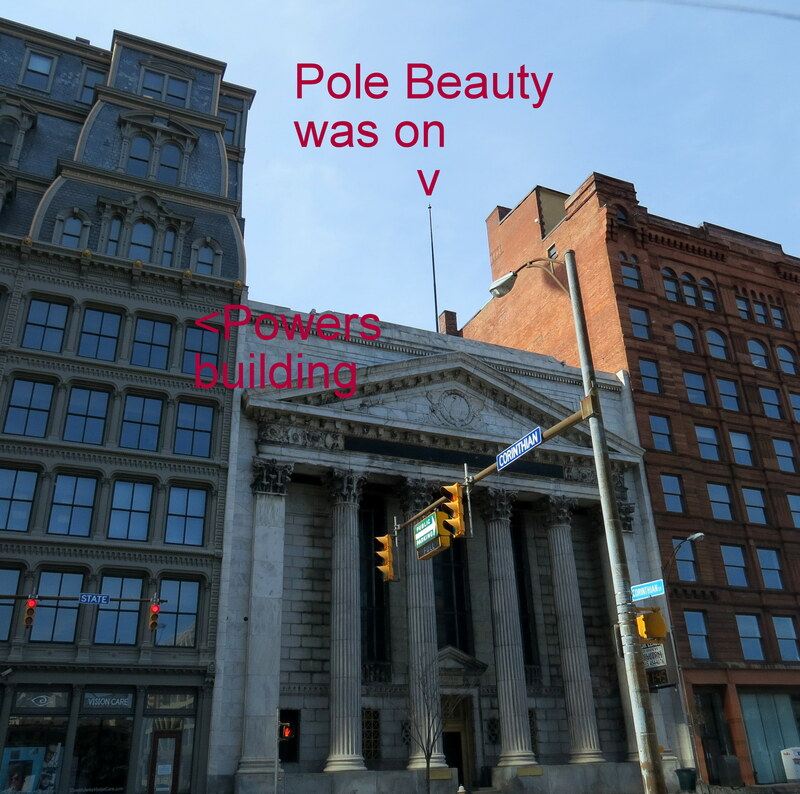 The address on the front of the building was 39 State St. and it’s connected to the Powers building. 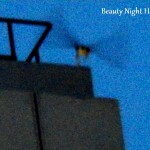 Beauty flew off the pole heading southwest and I quickly lost sight of her being surrounded by buildings. I took a ride around the city without finding Beauty or M and ended up on the Andrews St. Bridge where Joyce and Steve met me. It was at this point I ended my 6 hour watch which flew by and seemed more like just a couple hours. 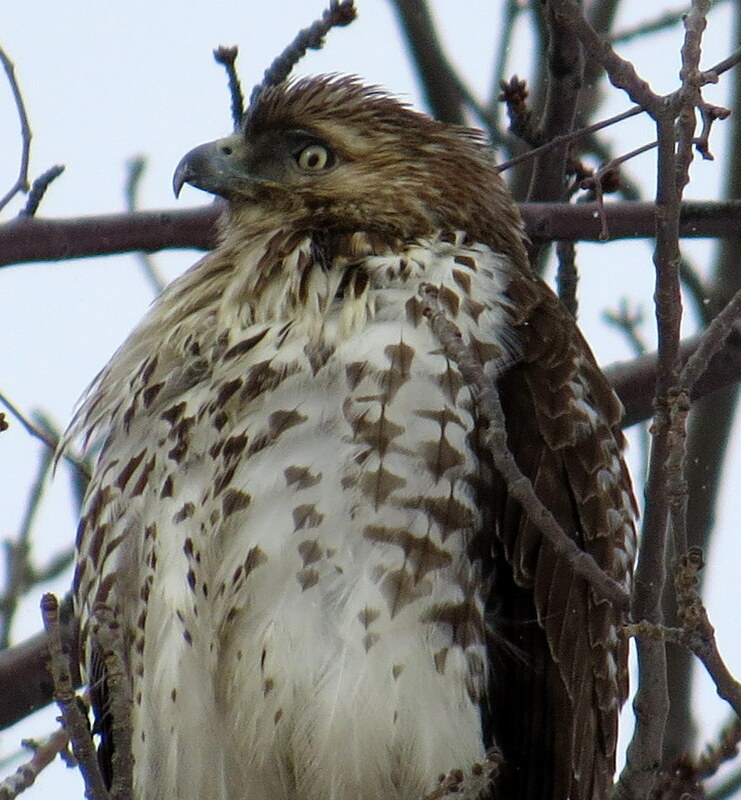 Keep smiling as we begin the season here in Rochester with 3 females and one unbanded male-I know I will! Today was supposed to be our best chance for sun in the next few days but it didn’t happen for my morning watch. The temperature was 31 (F) -1 (C) same as yesterday with hardly any wind and no precipitation of any kind. 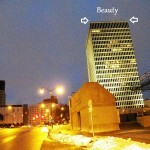 From the Broad St. Bridge I spotted Beauty on the top arm south side of the jail tower at 6:40am. I drove over to Troup St. to be closer but she didn’t stay long after I got there-maybe a minute and a half. 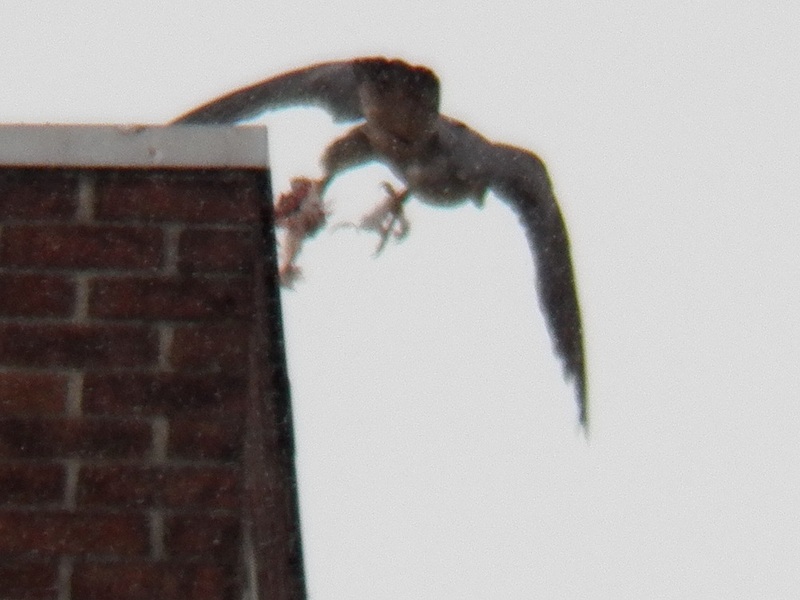 Right after this one pic I started to record a video and seconds into it she flew off into a stoop toward the river and I lost sight of her. 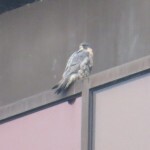 I found her on the top ibeam southeast side of OCSR as soon as I got back to the Broad St. Bridge. 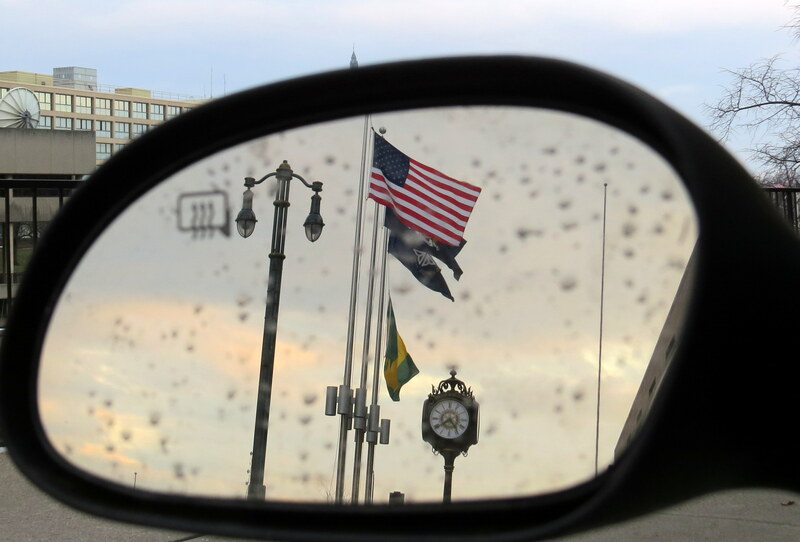 As I sat by the Radisson Hotel I noticed the American Flag waving in my side mirror from across the street in front of the Rochester Convention Center. I do love our flag! 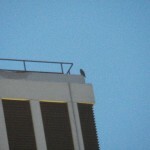 I stayed with Beauty until about 8:ooam as she preened and kept an eye on things in her air space and below. 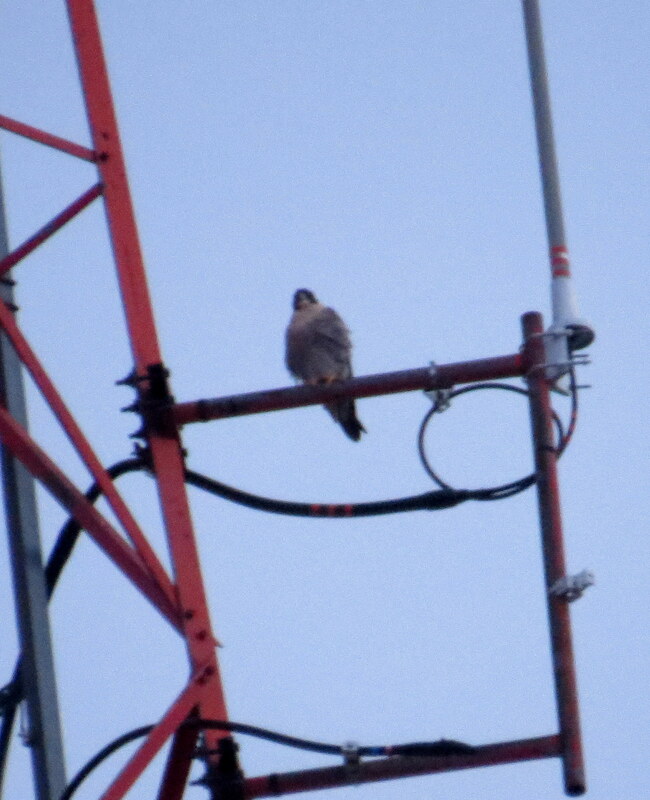 During that hour I did take the mile and a half ride to the Lake Tower site but didn’t see a falcon there. 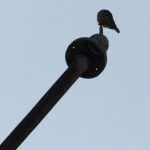 I arrived at the Brighton location around 8:1oam and found Pigott in the PEFA tree. The 3 crows that harassed her the other day showed up within a few minutes of me getting there but this time she didn’t stand her ground. They successfully convinced Miss Pigott to get out of that tree as she flew off to the north. She didn’t return until after the crows left-smart girl! 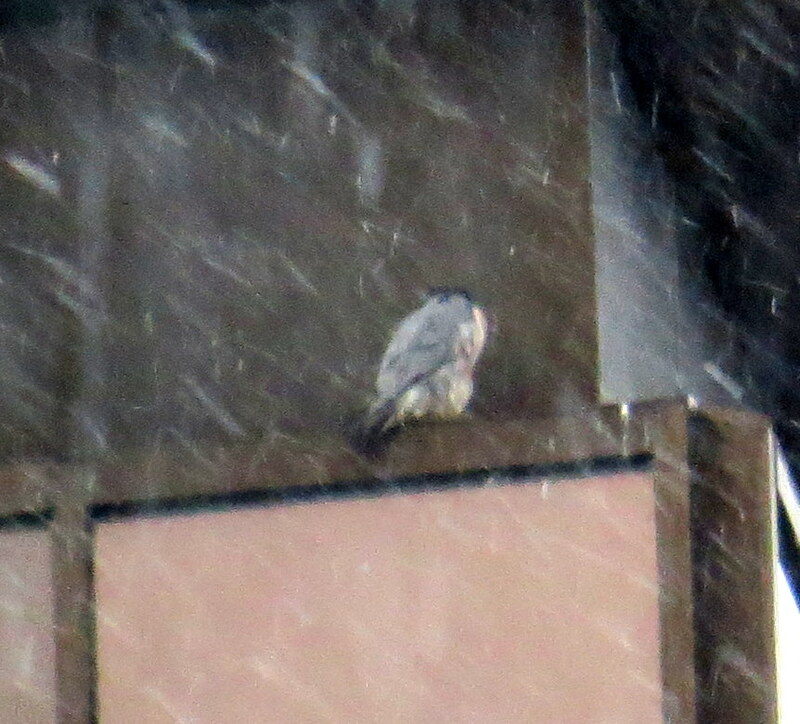 I would like to have stayed longer but I was to pick up Joyce at 9:00am and travel to Buffalo for a falcon watch. I checked for Beauty on my way thru downtown but she was gone from the OCSR so I ended my watch at 8:30am. 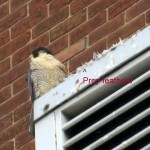 Our resident female falcons always send me home with a smile on my face! I wasn’t able to go directly downtown after work today and I almost decided not to go at all. Thankfully that didn’t happen. At 5:30 pm, I was ready to go, but where to first? Downtown of course. Since the light was already fading, I knew I didn’t have long before it was dark. 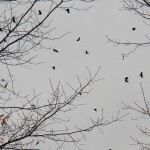 It had been overcast all day long, not one bit of sun, with temps in the 30’s (F). 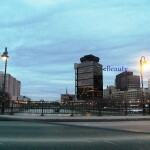 The Broad St Bridge was pretty much empty by 6:00 pm and the traffic was lessening. 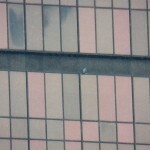 I parked on the north side of the bridge facing Mercury and the Times Square Bldg (TSB). 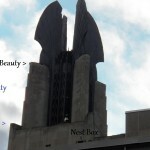 I was just getting ready to take another picture of Beauty before heading over to the BS location to check on Pigott when I looked up at the TSB and saw a familiar shape sitting on the ledge above the nest box. What! 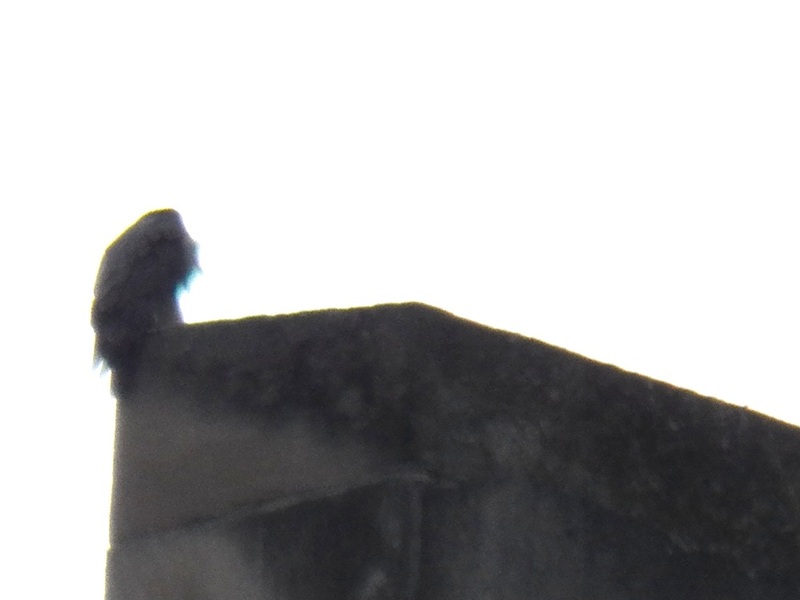 My camera moved from the Mercury statue to the TSB and I took a picture of the falcon sitting up there. 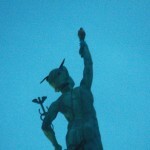 I quickly checked the Mercury statue to make sure that Beauty was still there and yes, she was! Woohoo! I quickly tweeted out with shaking hands “WE HAVE TWO!”. 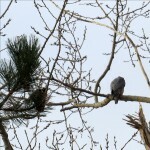 It was time to get out of my car and observe these two. There were so many questions running through my mind. Was this DC? 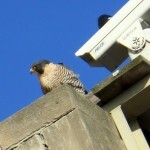 Was it another tiercel? Would they be aggressive? 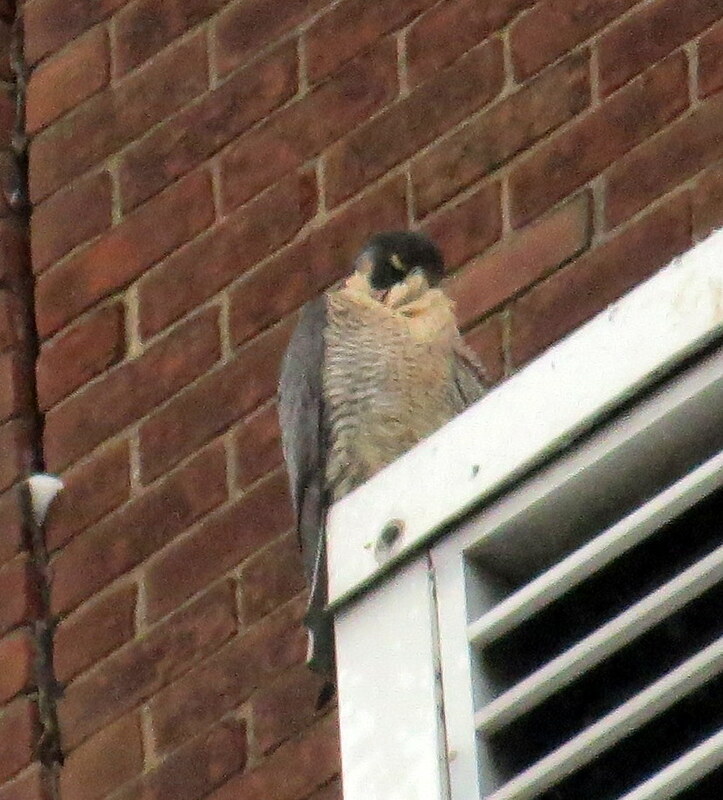 Beauty obviously knew the tiercel was on her building sitting just above her nest box and she seemed ok with that. She was just watching and so was I. 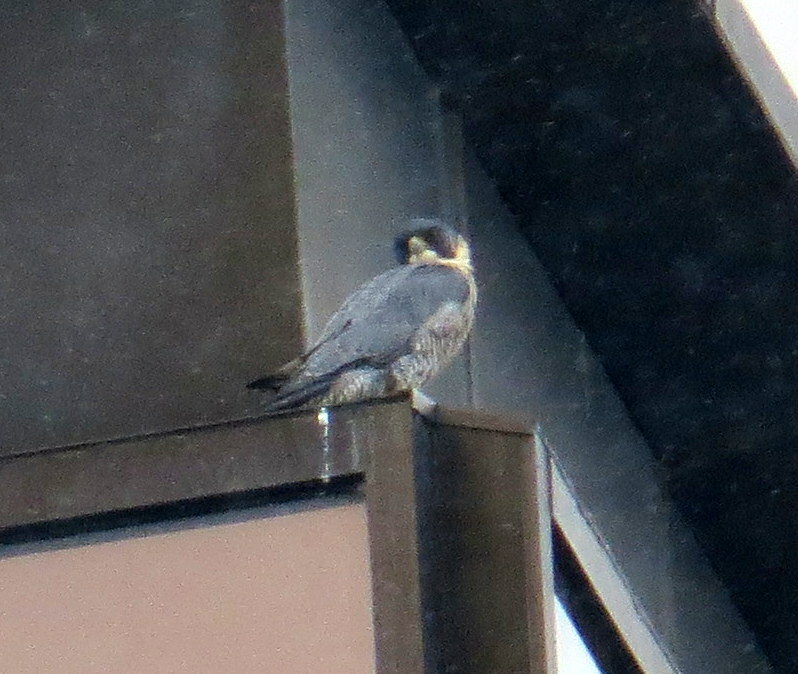 The tiercel took off and flew over the river, past the Hyatt, crossed in front of the Lincoln Bldg heading towards the B&L bldg. That was where I thought he was going to land, but he didn’t. 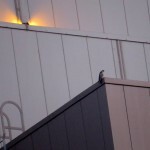 He turned back, heading towards the Hyatt and landed on the south side on a lower roof. 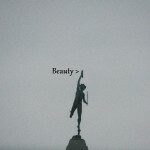 Not the normal spot I would see Beauty on beneath the sign. 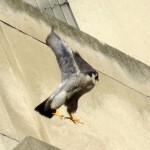 I turned back to see Beauty take off and go to the nest box. She didn’t stay long. 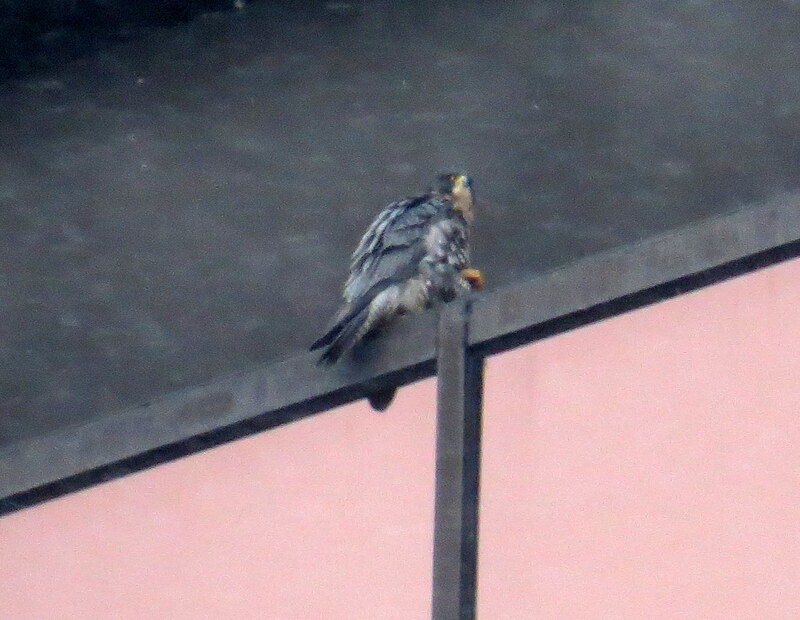 Beauty left the nest box and flew out to the Hyatt landing a few feet to the right of the tiercel. I quickly tweeted out again what was happening. 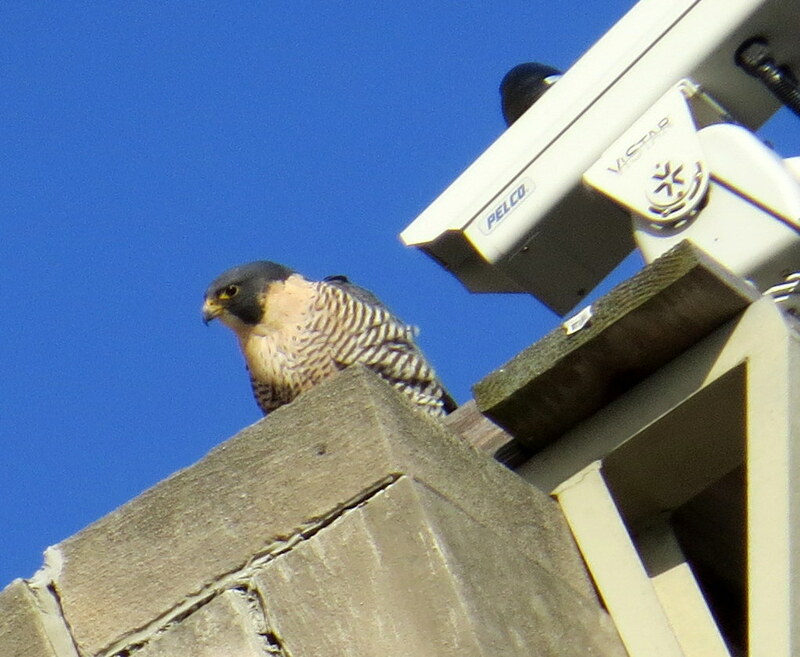 They stayed side by side for a short while and then the tiercel took off and did some spectacular display flying for Beauty. I hadn’t seen this type of flying in a very long time. Kaver flew like this for Mariah. It is a joy to see. I truly wished it had been lighter, since I would have loved to get a video of this aerial ballet to share with everyone. Beauty stayed on the corner of the ledge while the tiercel flitted about, flipping and flapping his way around her. Landing now and then and taking off again. In this picture he landed just to her right. 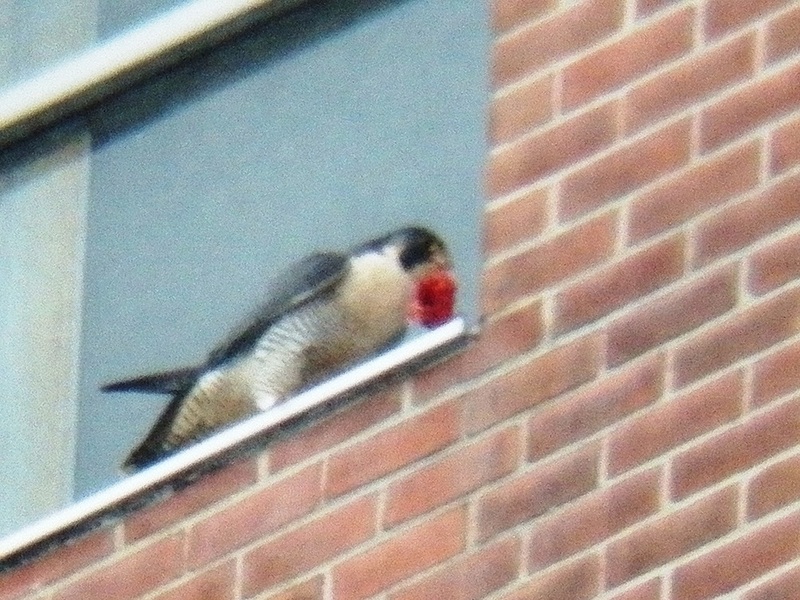 I can not say if this is DC or another tiercel that is trying to impress Beauty. 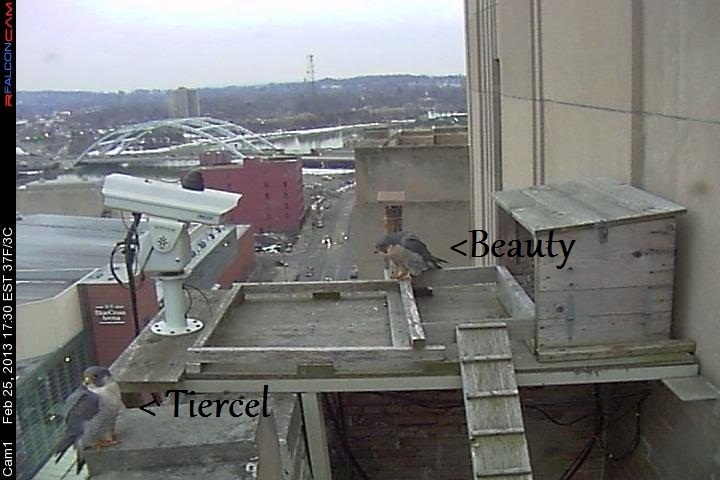 Just before I arrived downtown for my watch, the nest box cams caught this picture of the both of them at the nest box. Fellow Watcher Pat walked by me on her way home from work and said hello. 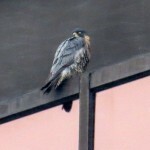 She didn’t know that there were two falcons, so I told her what I had seen. 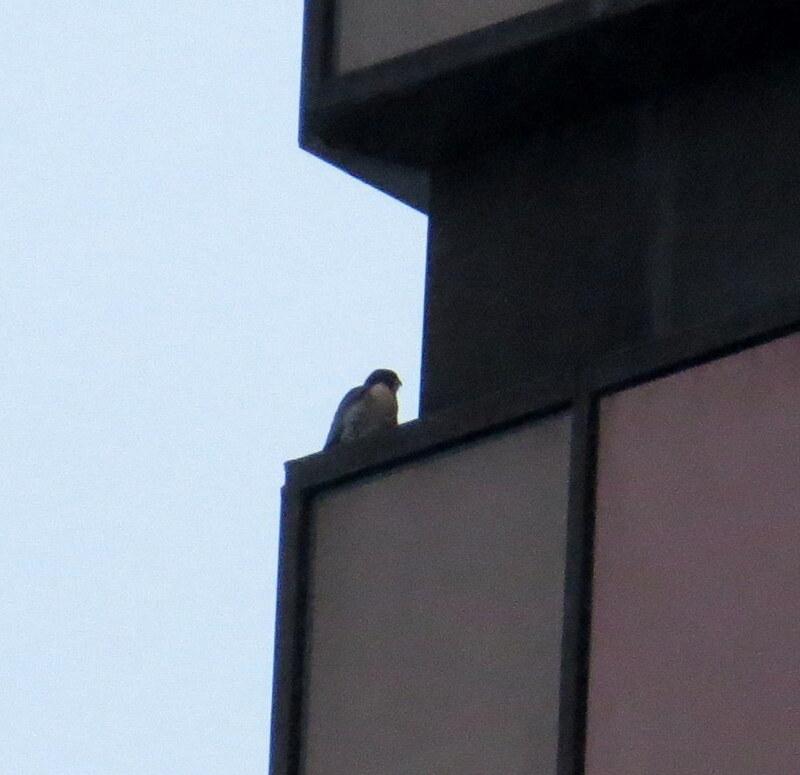 After she left, I continued to watch Beauty and the tiercel, who seemed to both be settled on the lower south ledge of the Hyatt. Kathy O soon joined me on the BSB, but by that time, it was dark and very hard to see anything. 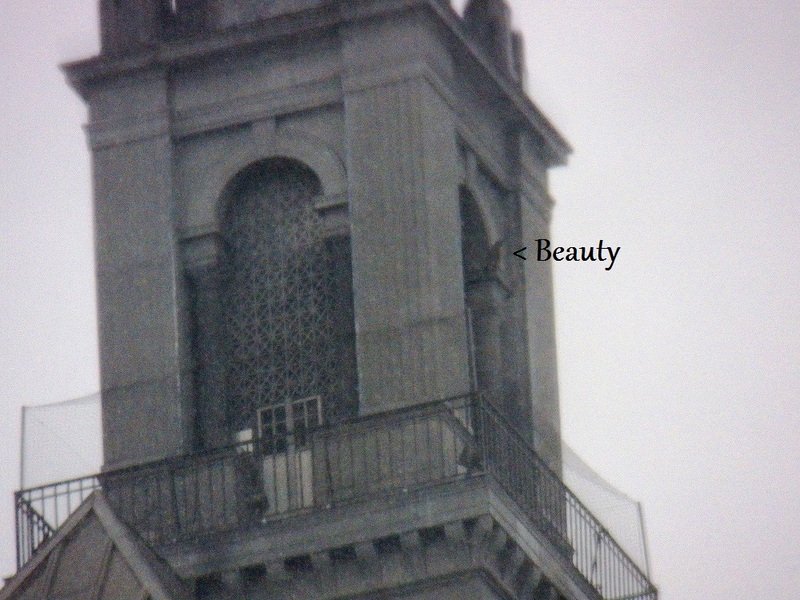 Beauty was gone from the corner of the ledge, but I never saw her leave, so I wondered if she had just moved back where I couldn’t seen her any longer. 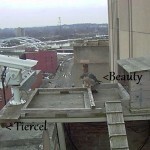 This picture shows where Beauty and the tiercel were located. By 6:50 pm it was dark, so Kathy and I decided it was time to leave. 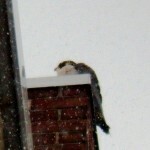 I am very excited to see if we will find out who this tiercel is tomorrow. 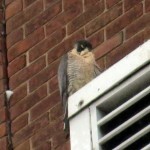 I hope he’ll visit the nest box and that the cameras there will reveal if this is DC or another tiercel. 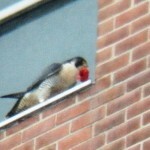 All I know is that Beauty seemed very comfortable with him and the tiercel with her. So it begins! At 9:50 am, a tweet went out that there was vocalization heard on the cameras at the nest box and that it might have been an alarm call. Thanks for the heads up Donna. 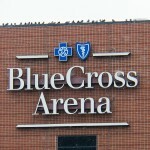 It’s that time of year when anything could be happening with the Rochester Falcons. I decided to get an early start on my watch. At 9:40 am I was at KP. 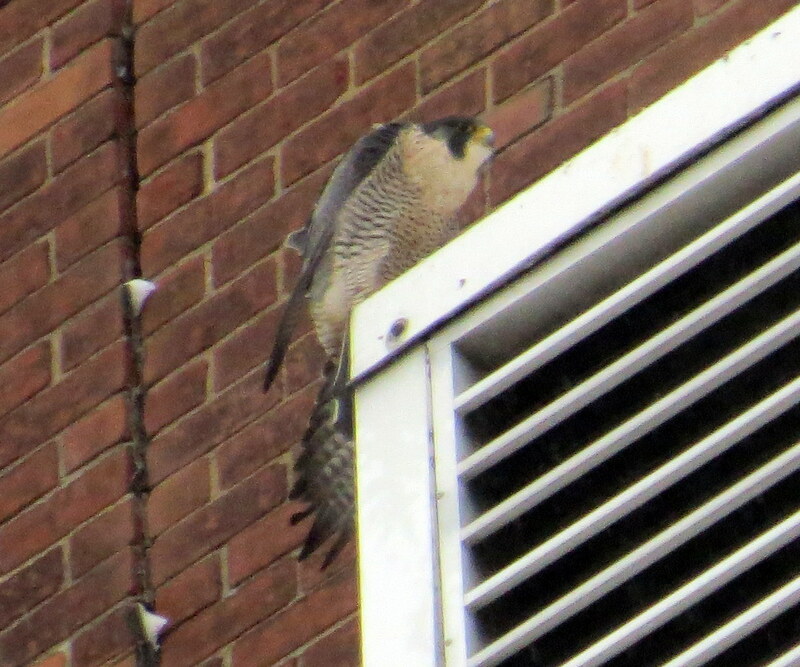 No Falcon activity there. At 9:50 am I was at the LT location. 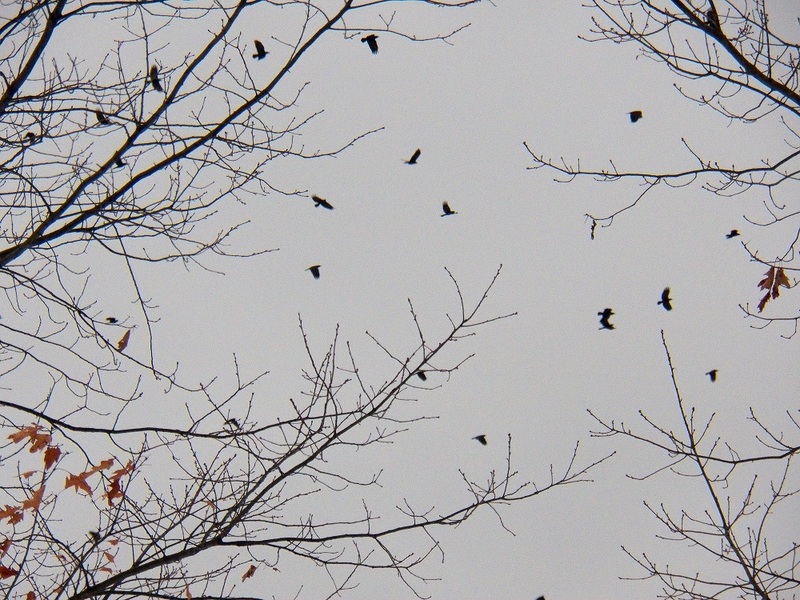 Lots of Pigeons, no Falcons. 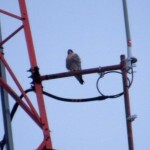 By 10:00 am, I had circled the Kodak Tower, checking all sides for Falcons and not finding any. I drove over to the Andrews St Bridge (ASB) and checked out the surrounding area. 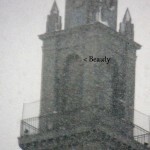 It was snowing again (big surprise). 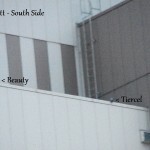 The last report had Beauty on the top IBeam, SE side of the OCSR. I wanted to check out the downtown area to make sure there wasn’t a 2nd Peregrine hanging out. At 10:30 am, I made my way over to the Broad St Bridge (BSB) and found Beauty where she had last been reported. I settled in to keep an eye on her. 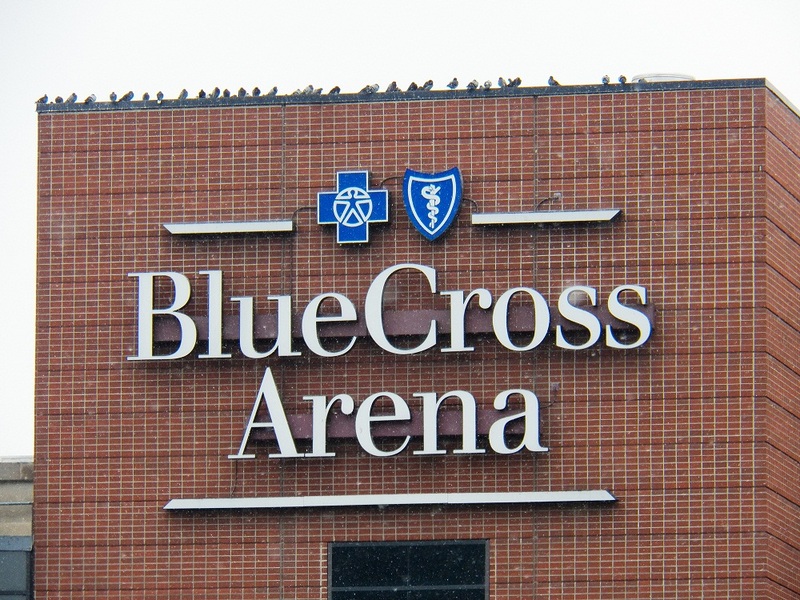 The Pigeons were lined up on the Blue Cross Arena aka Rochester War Memorial, like they always were. Dana joined me for a short while before heading off to check the other locations. 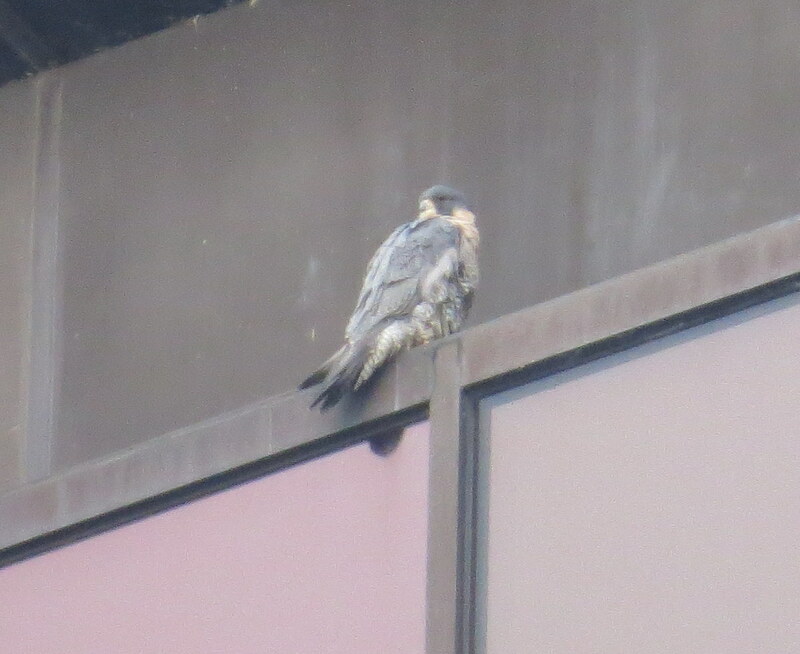 After an hour and a half of watching Beauty preen and the Pigeons take flight and land, it was time to go see if I could find Pigott at the BS location at noon. My timing could not have been more perfect. 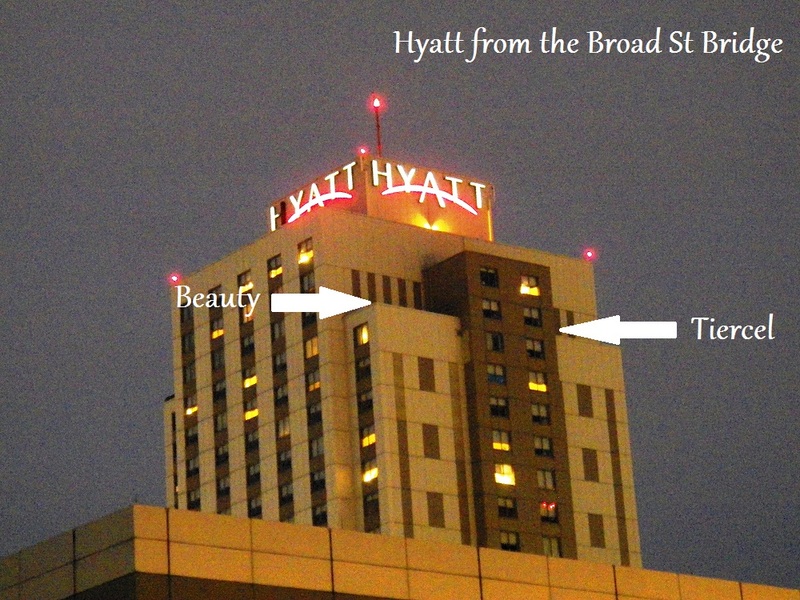 I was still about 2 blocks from the BS location when I spotted a familiar shape flying over heading in the same direction I was headed, east. I turned left and followed. 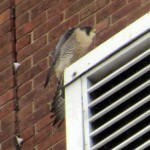 I got caught at a red light, so I couldn’t keep up with the Falcon I had seen. When I arrived at the BS location, I found Pigott on the NE corner of the building with the Pigeon she had carried for quite a distance, I would guess about a mile, to her building. That was incredible to see. Like I said, perfect timing! 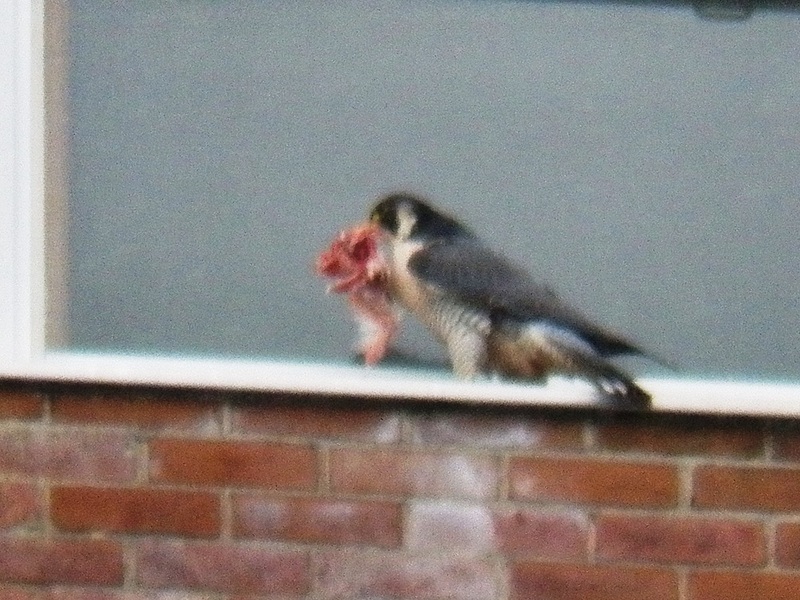 For two hours I watched Pigott eat most of the Pigeon she had successfully hunted. You can see how large her crop got in the pictures above. Kind of a before and after. After eating her fill, Pigott grabbed the remainder of her meal in one talon and took off, looking for the perfect spot to cache her leftovers. 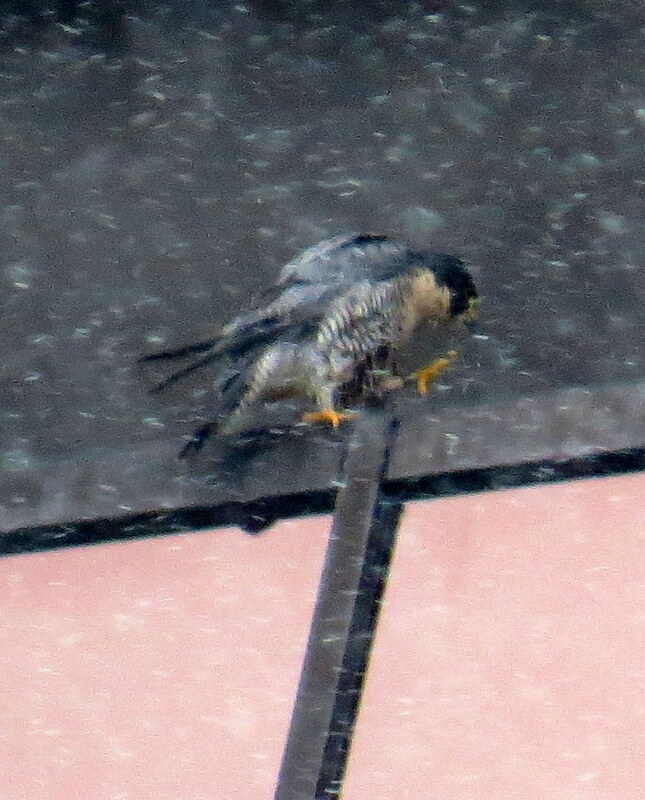 First she landed on a lower ledge. Pigott walked around trying to decide if this was the right spot. Obviously it wasn’t. 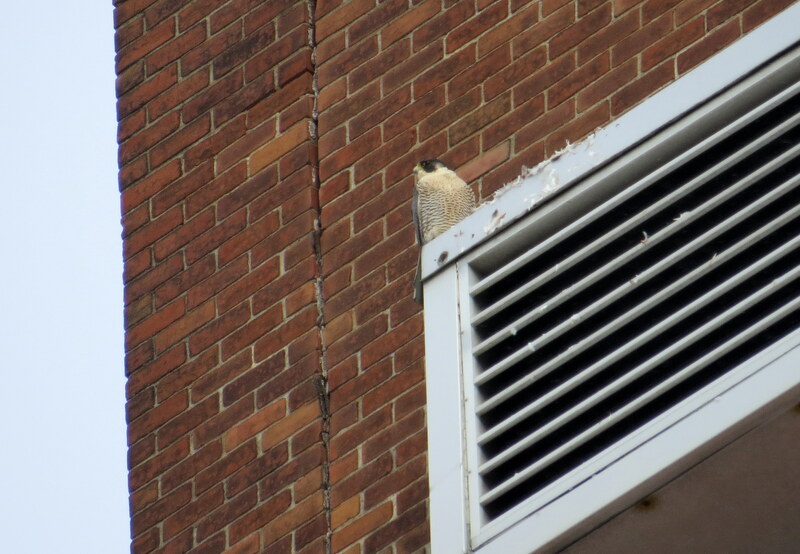 She took off and flew to the front (north side) of the building. I found her on a windowsill on the north side of the bldg in the middle. How about this window? No this just won’t do! She was off! Pigott flew to a windowsill on the front of the east extension. She strutted back and forth, laid down the food. Walked away and looked back. 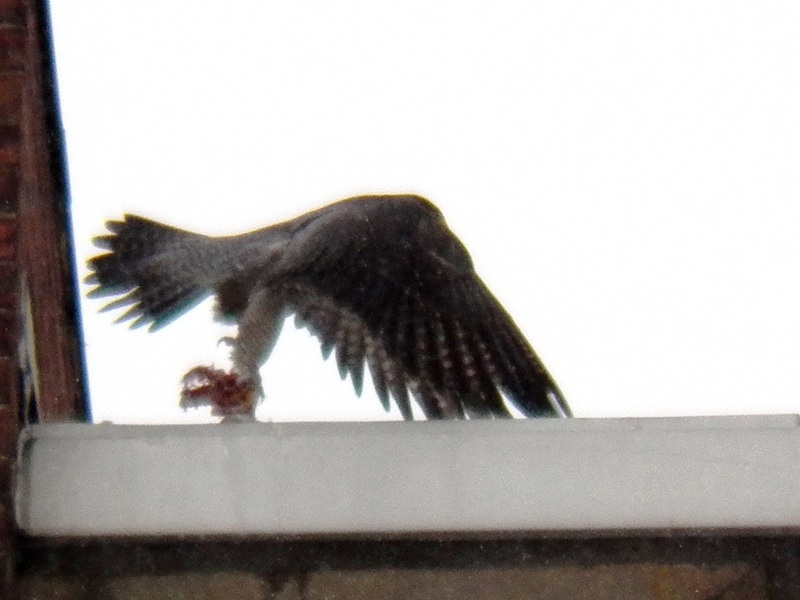 She ran up to the the food and grabbed it, again taking off with it in one talon. 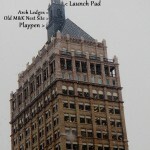 Pigott landed on the center part of the building that juts out. This was a nice deep ledge and apparently more to her liking. She disappeared from view for a few moments and then came out to the edge where I could see her. 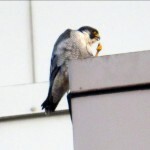 I couldn’t help but be amused by her behavior, but it is a vital part of their survival to be able to store (cache) their leftover food for later consumption. I’ve seen Pigott cache food on windowsills before and go back and finish it. But if it’s too visible other birds could find it and take it. I’ve seen Hawks and Crows do this. It was time for me to head home, but first I would check on Beauty one more time. Downtown was very busy. Both Dana and Ruth told me that there was a Lancer game this afternoon at the Blue Cross Arena and that Abby Wambach would be there. The Broad St Bridge was totally filled up. I slowed down and spotted fellow Watcher Dan on the bridge. I think he got the last spot. Due to the heavy traffic, I was not able to stop to say hello. 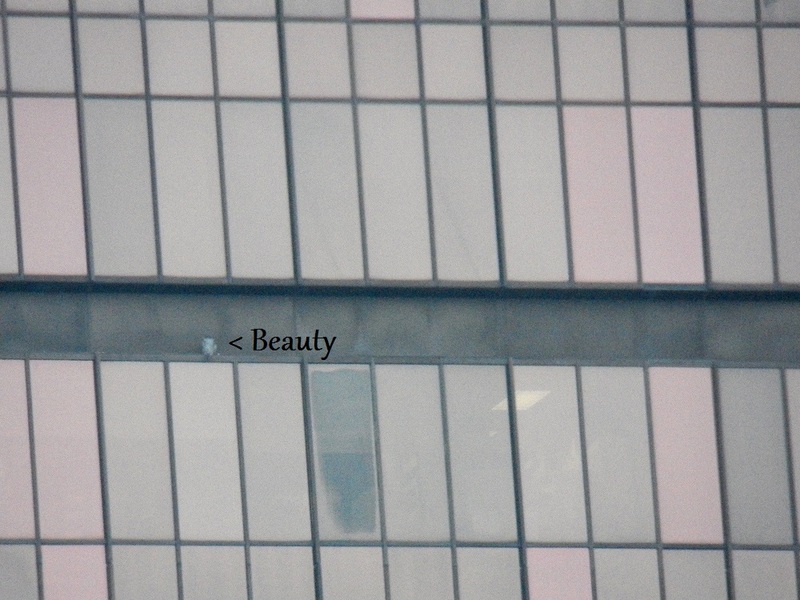 I continued on and found a spot down on Aqueduct St. Beauty was up on the Times Square Bldg. 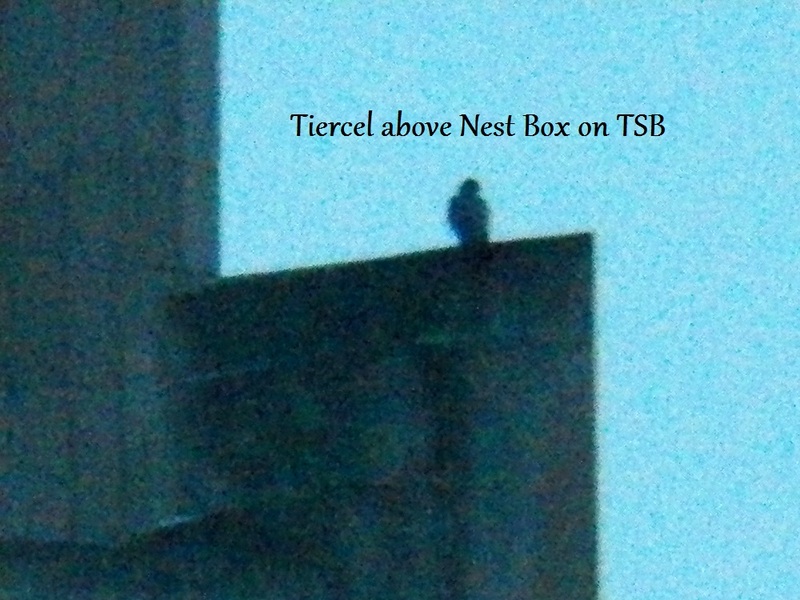 (TSB) on the ledge just above the nest box level at the south end. She was facing the south with the sun almost directly behind her. Yes, the sun came out for a short while this afternoon before it started snowing again. Beauty took off flying fast heading south. 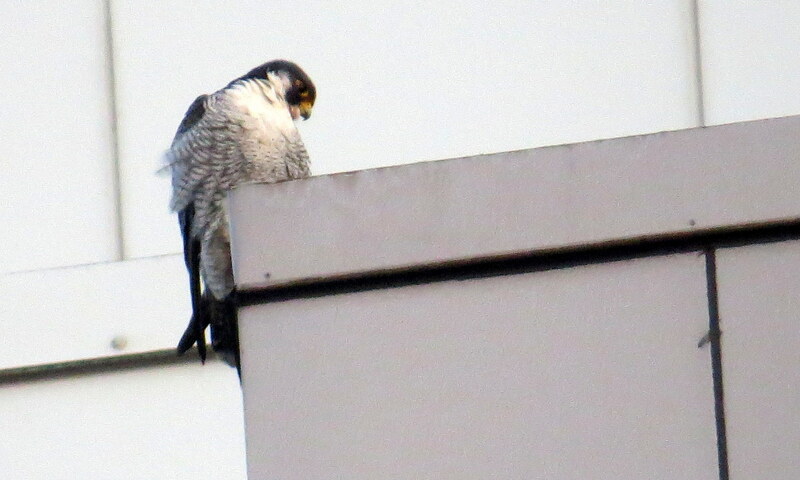 I waited a few minutes until she returned and landed on the base of the SE wing at the top of the TSB. 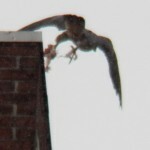 I watched her run in towards the wing and drag something out. This was a known spot that Beauty cached her leftovers and she had just selected something from the pantry. 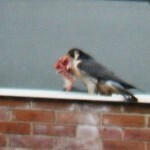 Feathers were flying and soon Beauty was enjoying her afternoon meal. 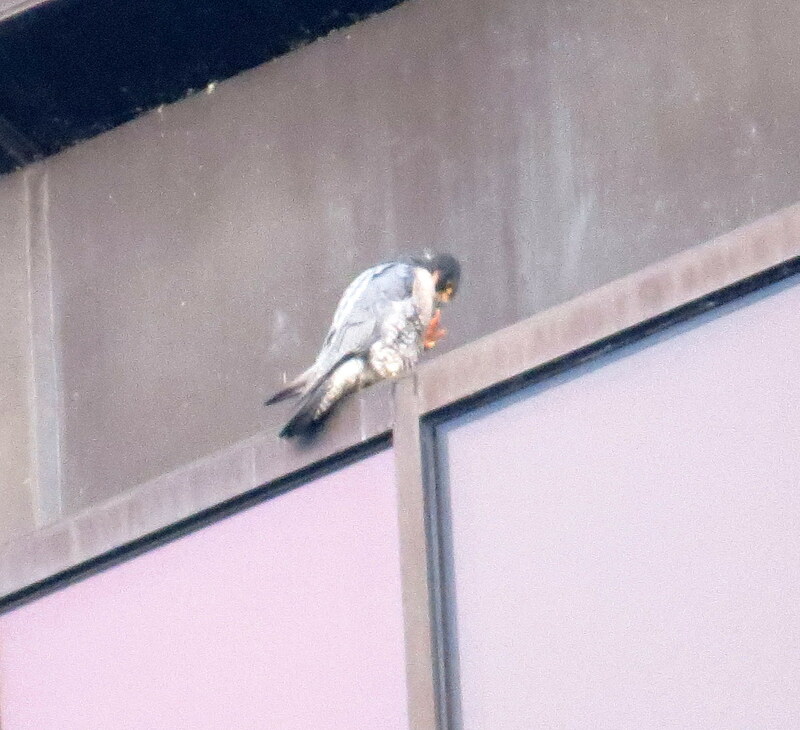 I watched her eat for awhile before leaving to check on the LT and KP locations. 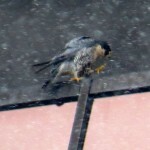 I did find LTF at the LT location and no falcons at KP. 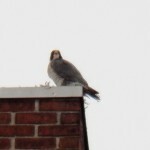 It was time for me to head home after again finding all three current Rochester Peregrine Falcons. 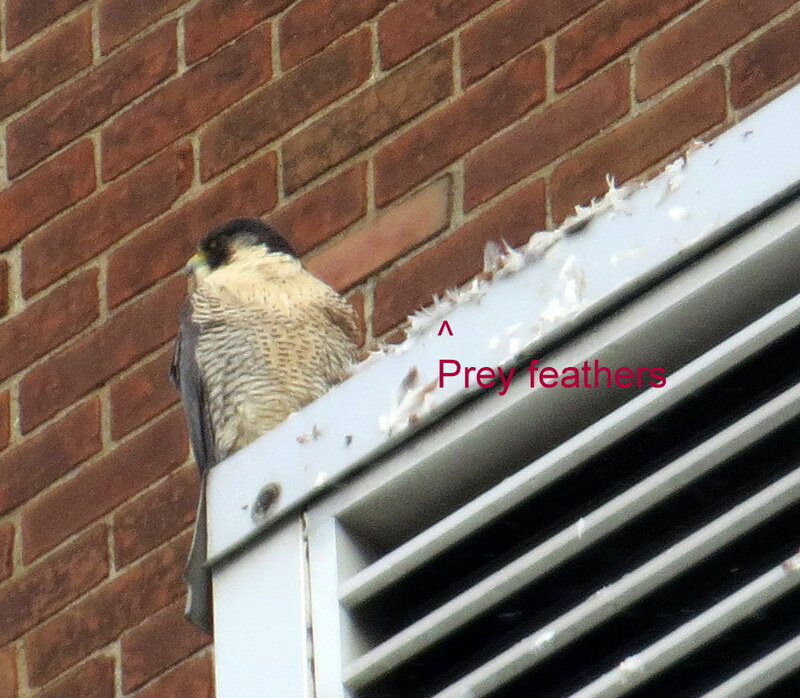 It was another peaceful Watch, with all three females remaining in their own territories. 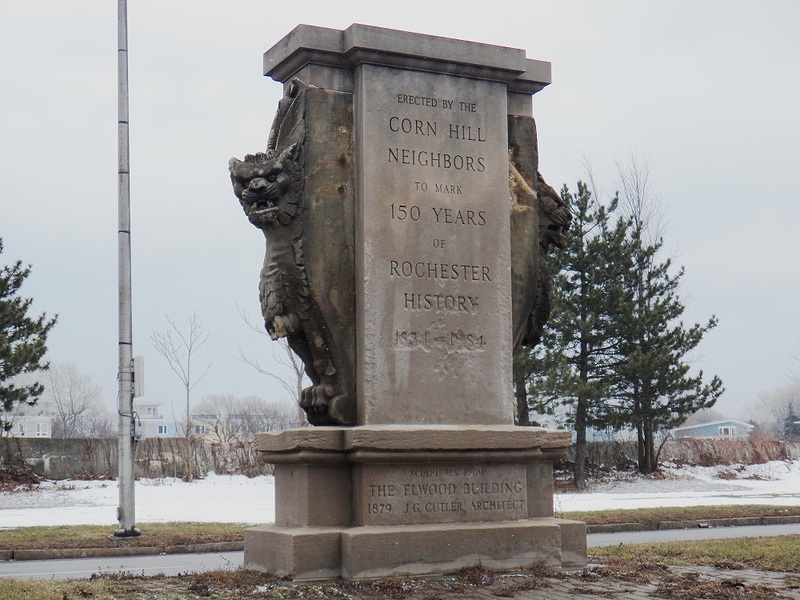 I’ll leave you with a picture of a monument I pass everyday when I drive through the Cornhill area. I always admire it, but have never had a chance to slow down enough to get a picture. Well, today I was able to do just that! REMEMBER TO CLICK ON ANY PICTURES YOU WOULD LIKE TO SEE IN A LARGER FORMAT. Well I got up today and didn’t see any snow on the ground or in the air so I thought I might actually get in a watch without it. Wrong-after I got downtown it started out light and by the end it was snowing pretty darn good. The temperature was 31 (F) -1 (C). 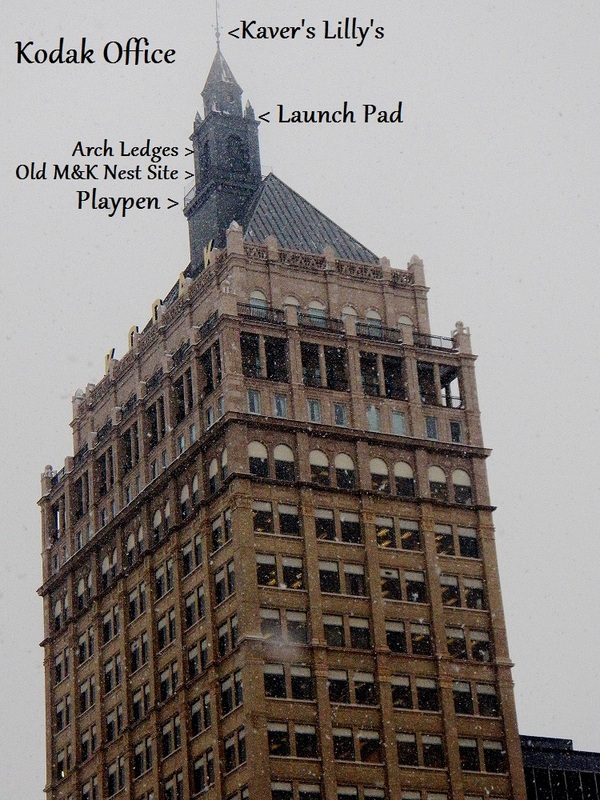 I spent the first 20 minutes of my watch looking for Beauty and checking the Lake Tower site. 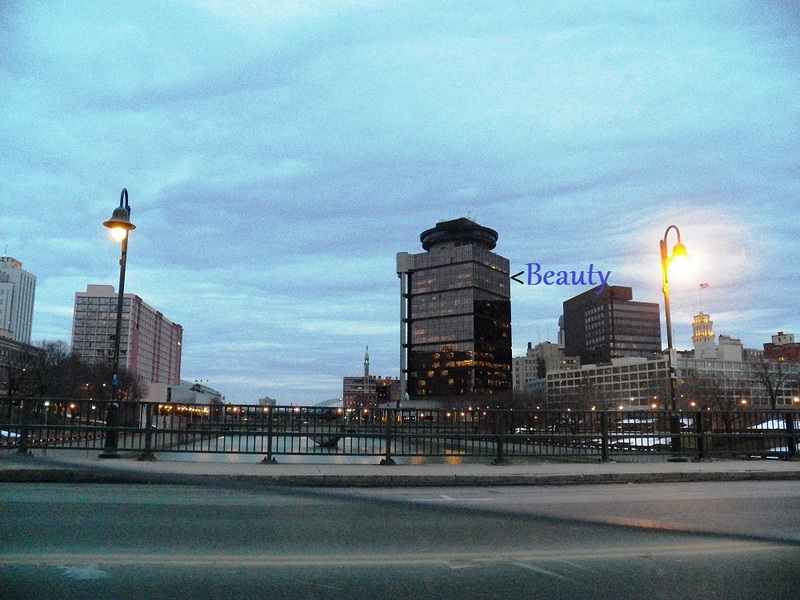 As I sat on the Broad St. Bridge facing east looking toward Xerox I caught movement out of the corner of my eye. 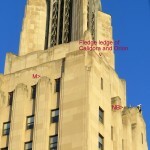 I looked to my left and spotted Beauty flying from the northeast over the Granite building passing in front of the Chase tower and then like she was shot out of a cannon turned toward me and the pigeons that were on the Blue Cross Arena. 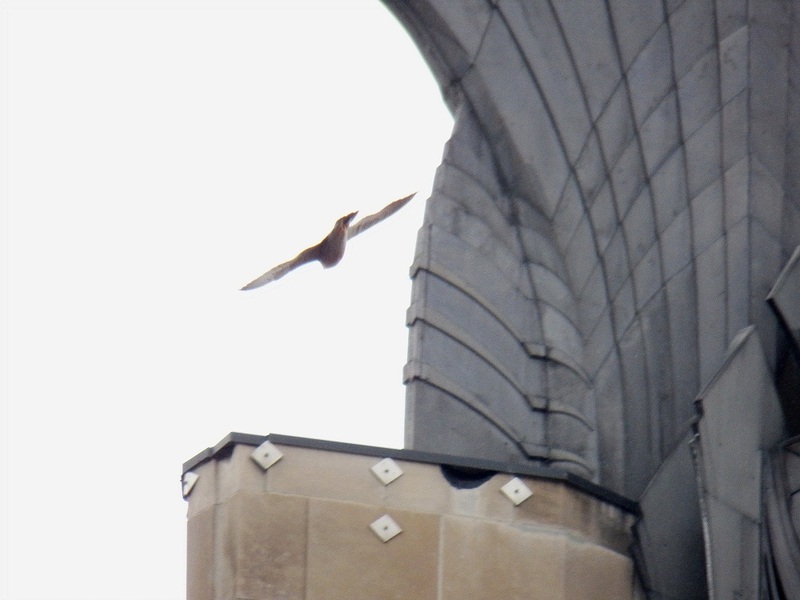 She streaked over the bridge and before I could turn around to look she disappeared to the south. 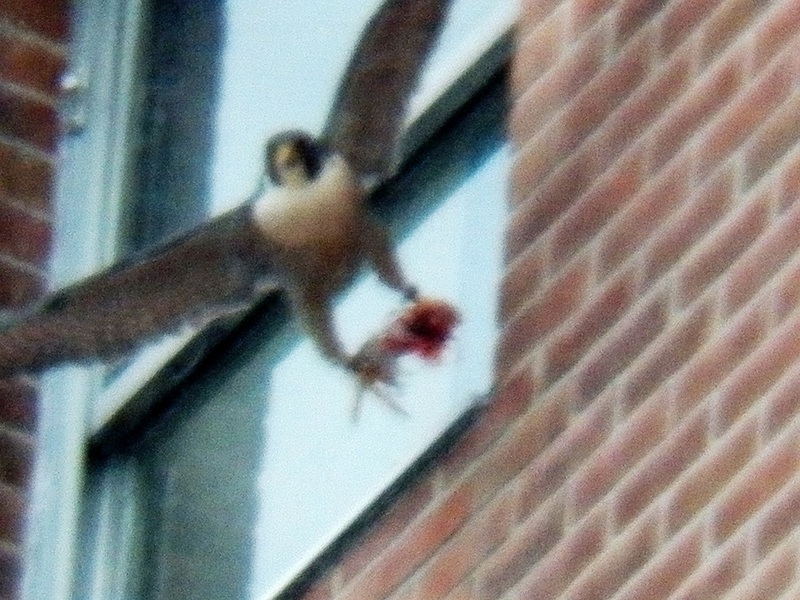 I have to tell you that nothing else in my life has gotten my blood pumping faster than seeing a Peregrine Falcon turn on the speed in flight. WOW! When I was on the east side I stepped out of my car to stand below Xerox, our tallest downtown building to give you a feel for what I saw. 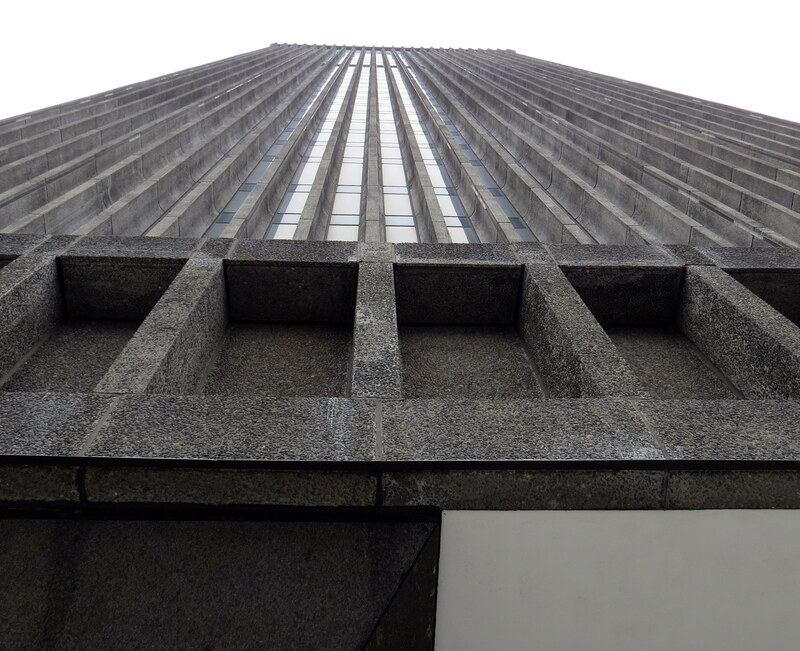 It’s really cool to look up from the bottom of these tall buildings. 15 minutes later after a ride around to the usual spots I found the Beautyful one on the main cam. 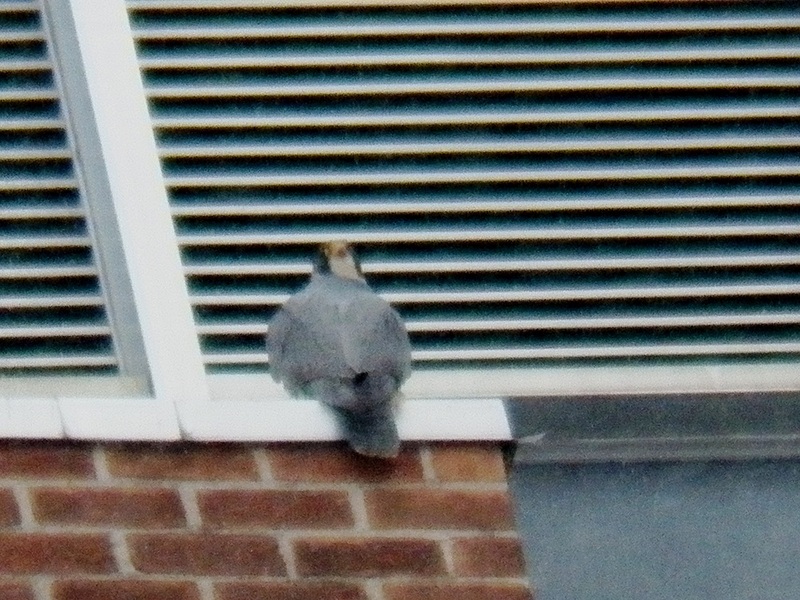 Beauty remained there for the next 50 minutes and flew off when I wasn’t looking. 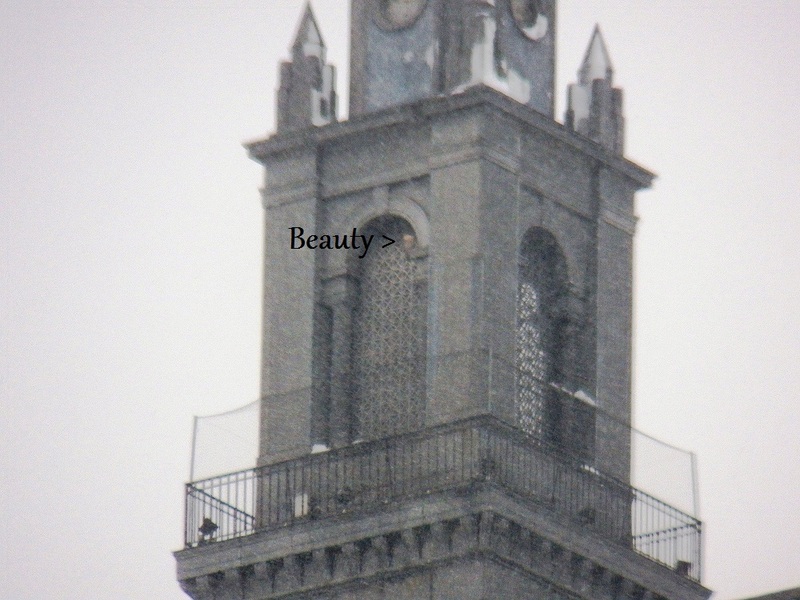 When I couldn’t locate her I went and checked the Lake Tower and Brighton sites to no avail. As I was leaving Brighton I got a text from Donna (one of our cam watchers) that there was a falcon alarm calling near the nest box so I went straight away to the Times Square building. 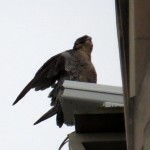 As I approached I could see Beauty under the southeast wing. 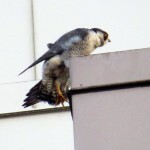 I went to the parking lot near He’s Chinese food and took a look around the surrounding area but didn’t see any other falcons. 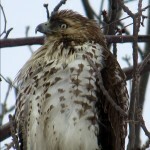 Beauty looked perfectly calm as she did a little preening so she may have been yelling at a hawk or crow. The hormones are telling her to guard that nest box now as the new season is about to start. Now we just need some males for our 3 females. 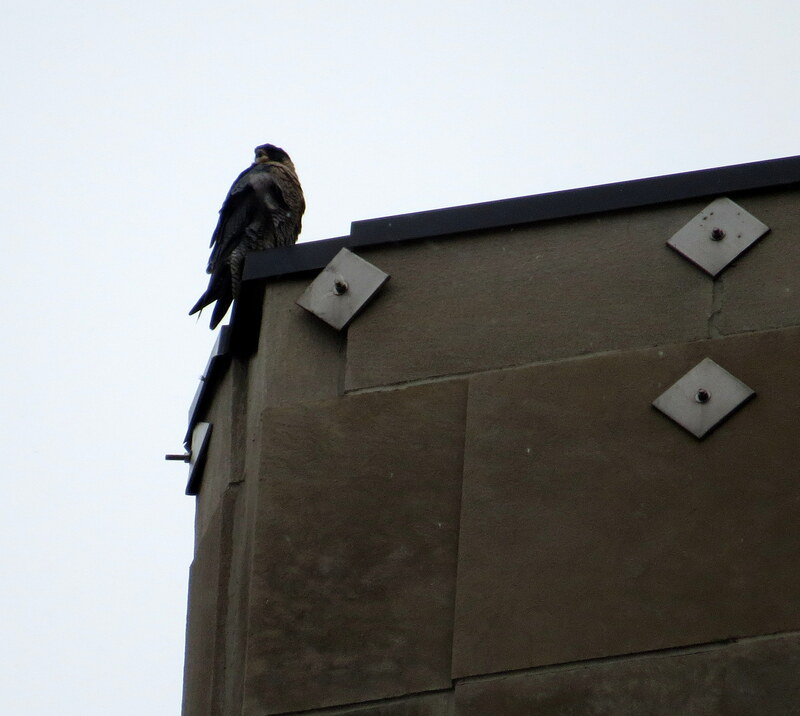 At 9:00am Beauty dropped off the back of the ledge and flew west out of view. 20 minutes later I found Beauty on the top ibeam southeast side of OCSR. The snow started to pick up at this point after starting out very light. 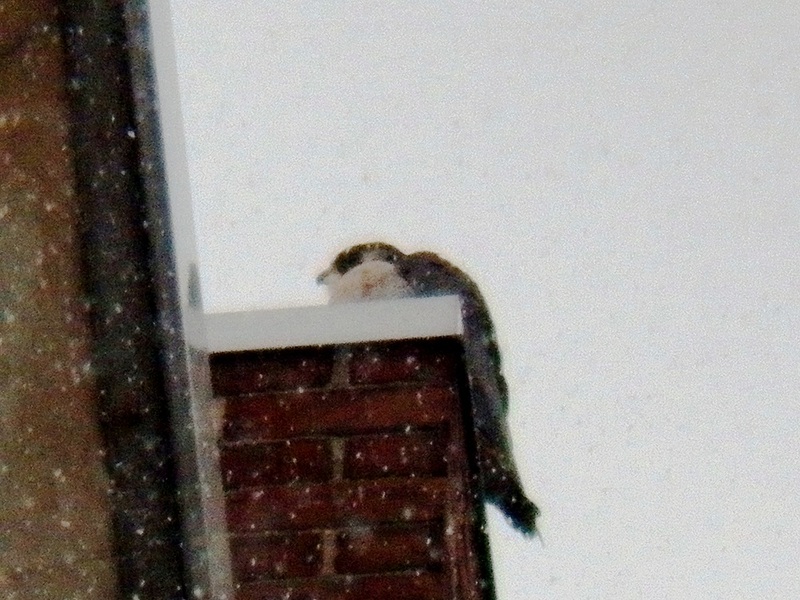 I spent the next hour watching Beauty thru the snow as she preened and slept with one eye open. I ended my watch around 10:30am with a smiling face!